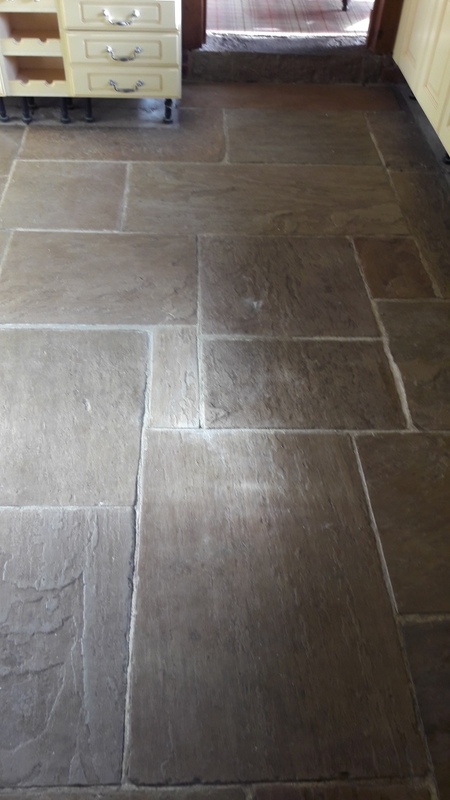 I can’t stress how important a sealer is when it comes to maintaining the look of a stone floor and although they can protect a floor for many years if not maintained they will all but disappear in high traffic areas allowing dirt and stains to penetrate the pores of the stone. This gradual degradation occurs over such a long period it usually happens without being noticed. 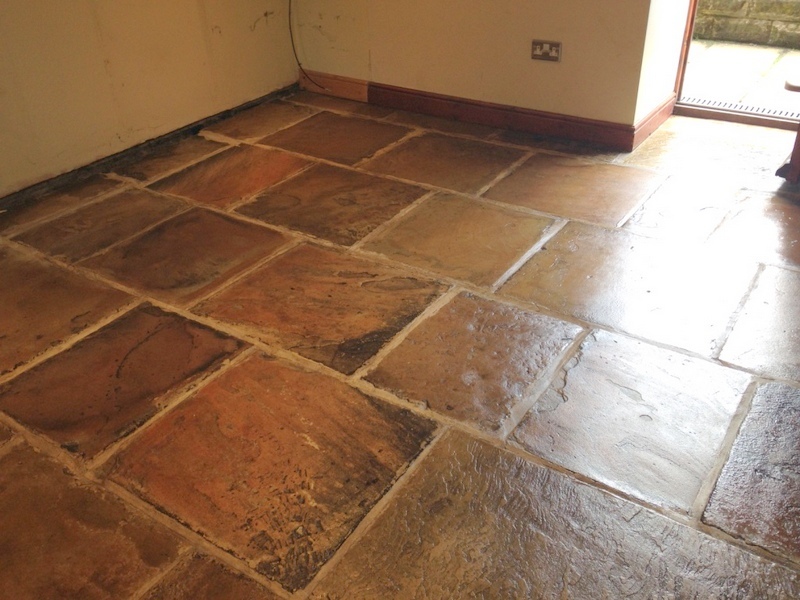 This Sandstone tiled kitchen floor and entrance hall at a barn conversion property in Sleaford had not been sealed in eight years. 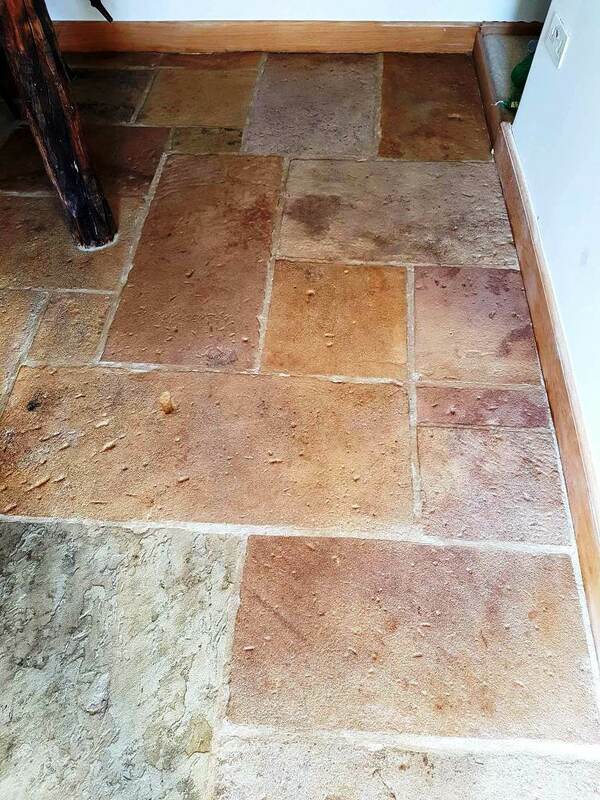 Since Sandstone is naturally highly porous, dirt and staining had easily become easily ingrained in the tiles. The result? A very dull and poor looking set of tiles. 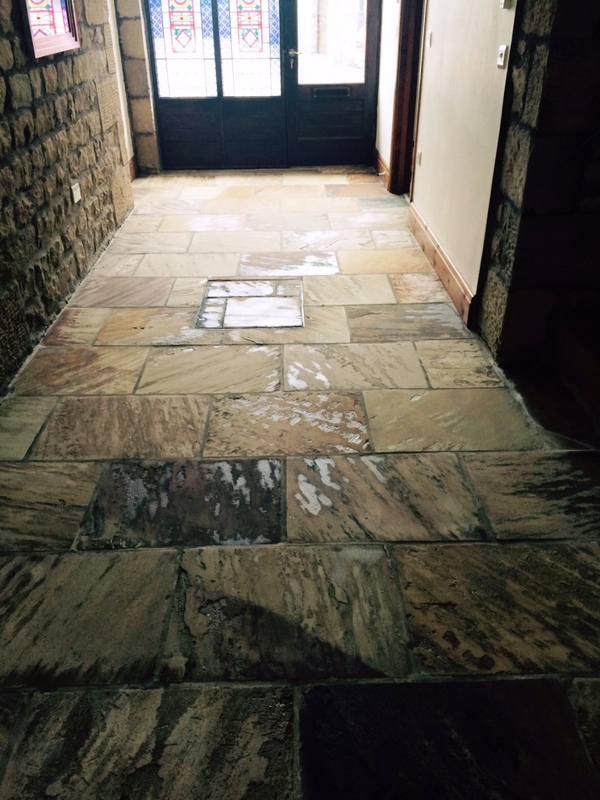 After difficulties trying to resolve the situation by themselves, the property owners asked me to deep clean the tiles to restore the appearance of the Sandstone which had faded over the years. Thankfully we have the right products, equipment, and experience to be able to carry out the restoration quickly and efficiently. The first day of work involved preparing the area by protecting other surfaces and removing the kickboards form under the kitchen units. 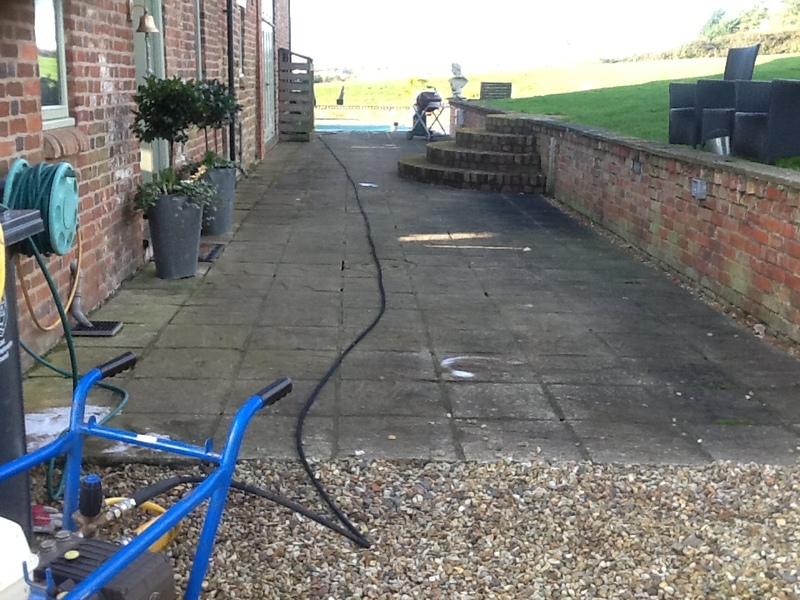 This was followed by a deep clean of the floor firstly with our high pressure Rotovac system which applies hot water under high pressure to force out ingrained dirt and muck from the stone whilst simultaneously extracting the soil back to a tank on our van. 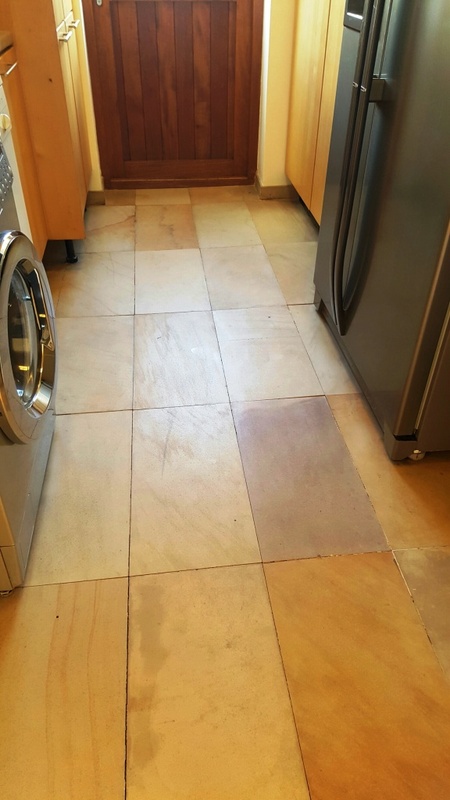 I followed this by scrubbing and rinsing the tiles and grout with a solution of Tile Doctor Pro-Clean, a high alkaline powerful cleaner we use on natural stone floors. This helped to tackle any particularly deeply ingrained dirt and clean up the grout. 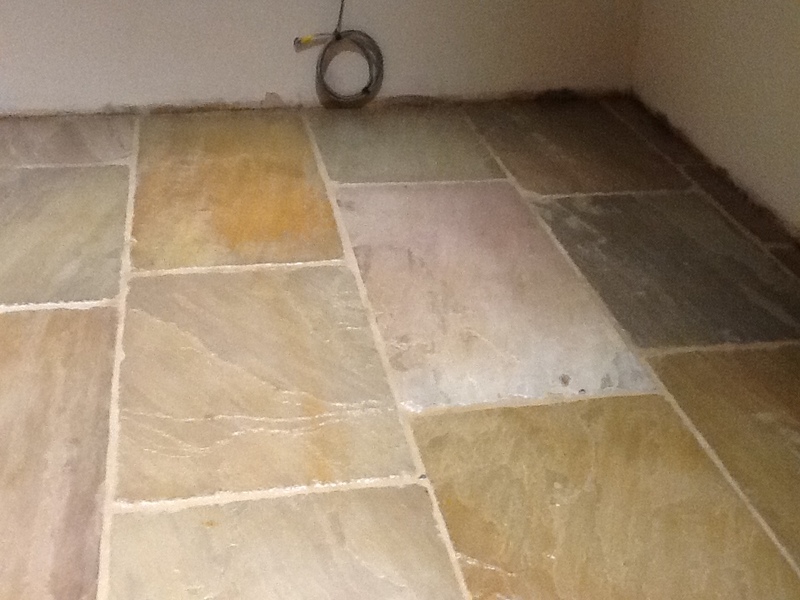 Following the clean, I installed turbo dryers and used the already in-built underfloor heating to dry the Sandstone, which was necessary as it is naturally a very porous stone and easily absorbs moisture. On the second day, the tiles were completely dry and ready to be sealed however before sealing I asked for the underfloor heating to be switched off so the fresh sealer would cure more naturally. 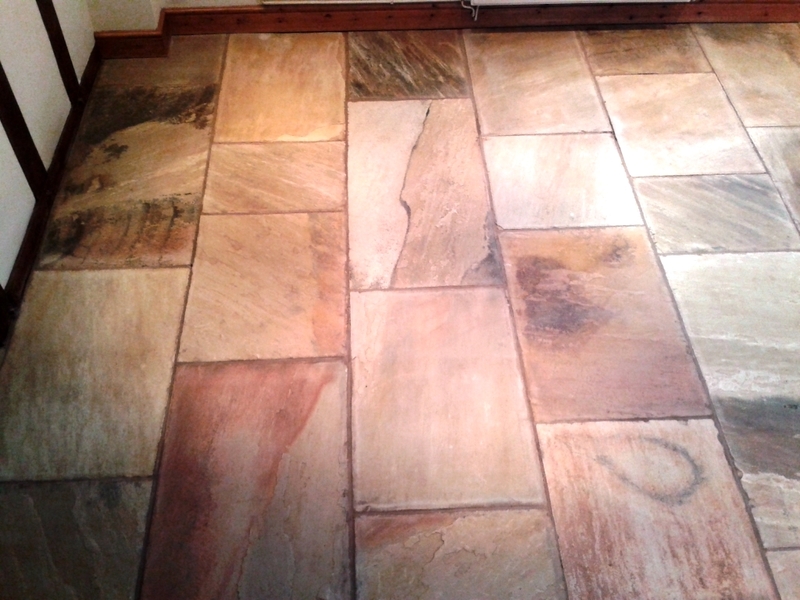 To seal the floor, I opted to use Tile Doctor Colour Grow which is an impregnating sealer that occupies the pores in the Sandstone so dirt can’t, additionally it’s formulated to enhance the naturally occurring colours in the Sandstone – those which after such a long time the customer was keen to see again. After two coats of Colour Grow were applied, the transformation was well and truly complete. The customer was also well and truly happy. 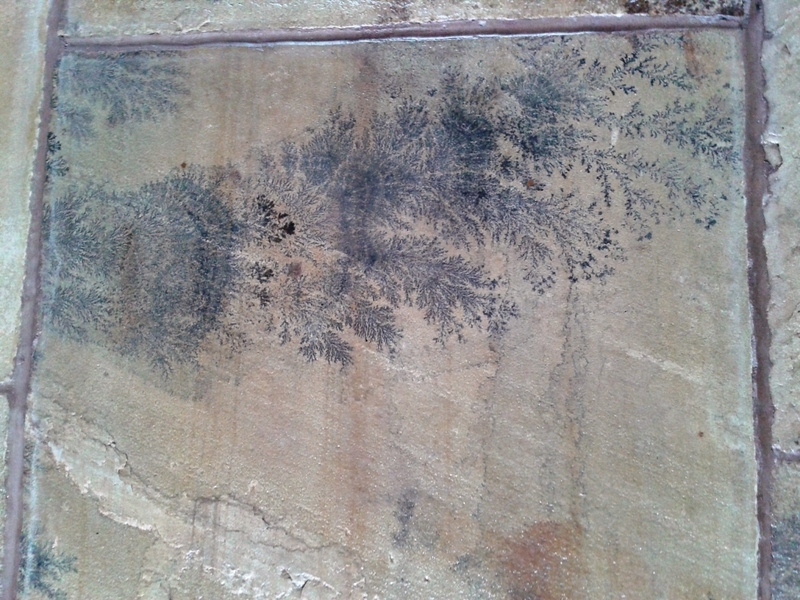 After eight years, the Sandstone tiles were restored to better than their original condition. One question I often get asked is how do you know when your sealer has worn down. 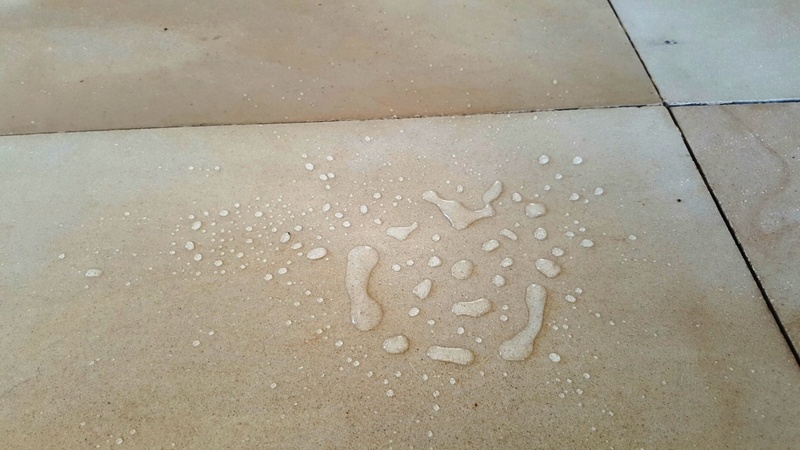 The answer is to conduct a water test on your tiles, if the water forms a bubble on the surface of the tile as in the photo below then it shows the sealer is doing its job. 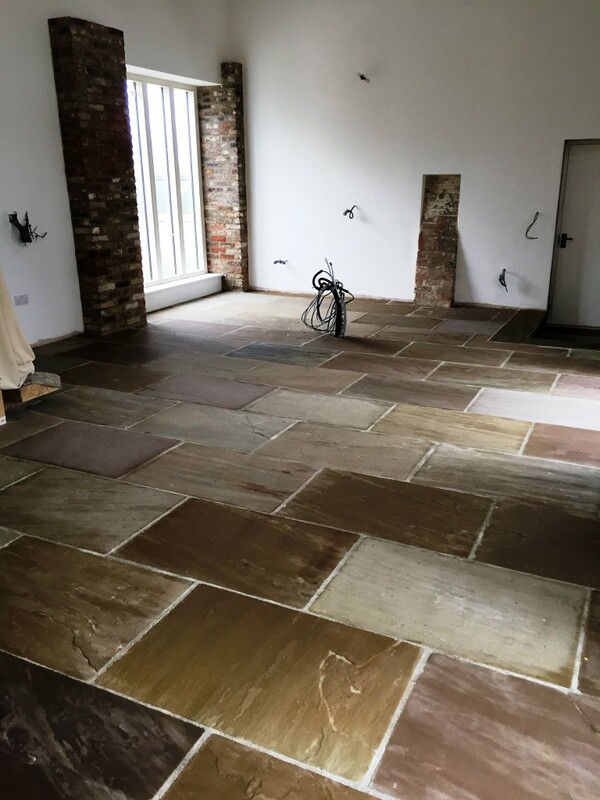 The owners of this barn conversion in Rugeley had got to breaking point with their large Sandstone tiled kitchen and utility floor. They had tried various different cleaning methods without success to clean the floor, but it always appeared grimy, and they suspected it had not been sealed following installation. This would make sense: a lack of sealer would have allowed the dirt to become ingrained in the stone, making it impossible to clean. Interestingly their next door neighbour had suffered the same problem and decided to replace the floor entirely. The property owners were seriously considering the same as a solution, that is until they as found Tile Doctor. I was called down to the property to see what could be done. 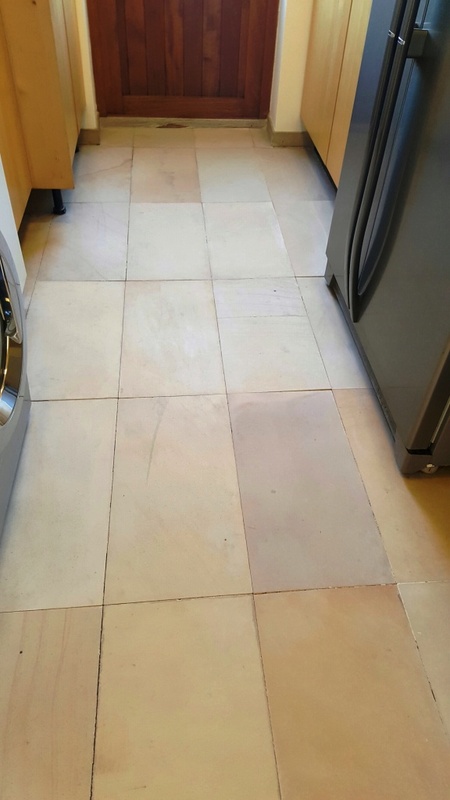 To begin the cleaning process, I applied a strong, undiluted quantity of Tile Doctor Pro Clean to the floor and left it to dwell for a few minutes. This allows the high alkaline cleaner to seep into the pores of the stone to begin to break down the ingrained dirt. 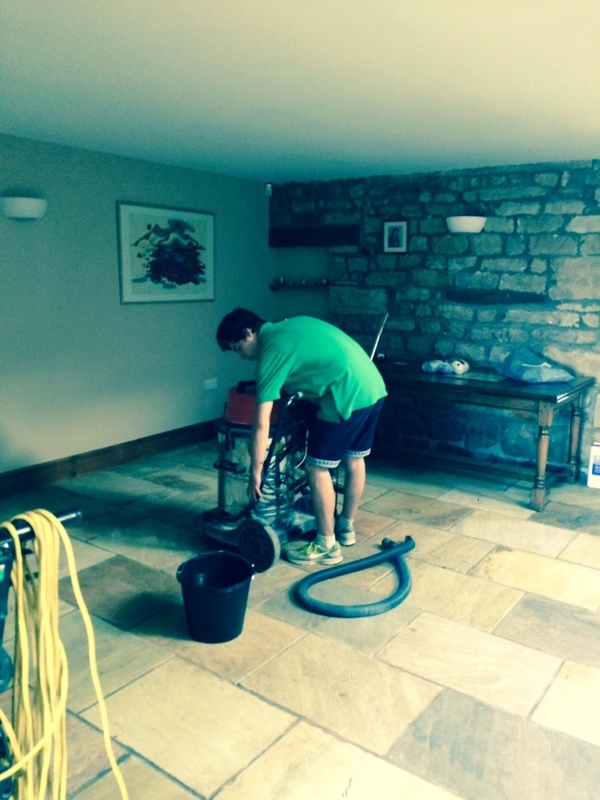 After the short dwelling period, I scrubbed the floor using a rotary machine with a black pad attached. With the tiles clean, I then focused specifically on cleaning the grout lines and edges of the floor using a grout brush in combination with a steamer. Finally, I rinsed the floor with cold water, before vacuuming up the resulting cleaning slurry before leaving the tiles to dry completely overnight. The drying period is exceptionally important because excess moisture can cloud any new sealers and damage their performance. I returned to the property the next day to find the clean tiles showing some signs of damp. 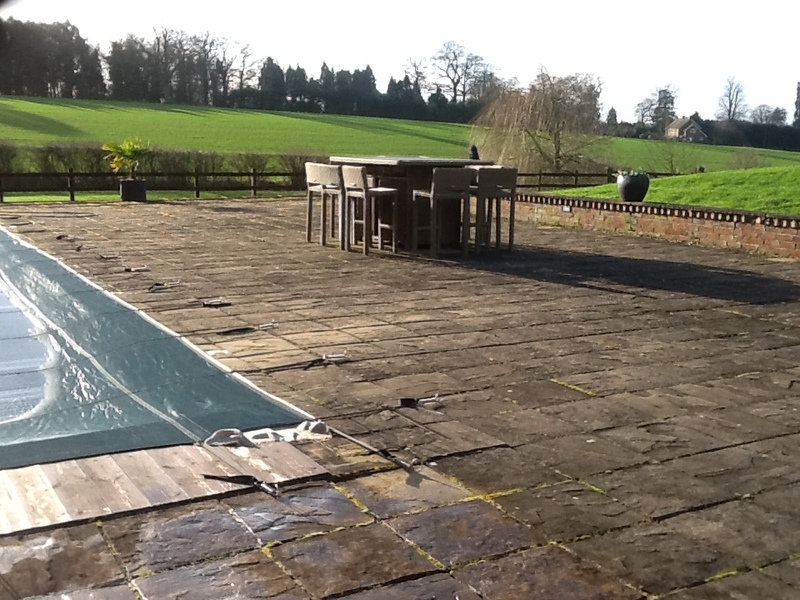 It’s possible that the property, being a barn conversion, does not have a damp proof membrane installed beneath the floor, making these sorts of issues inevitable. 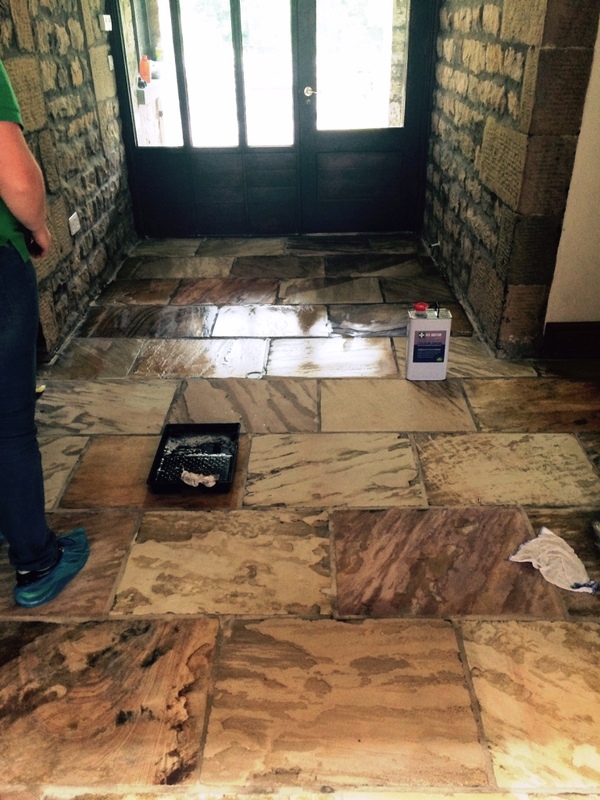 To be on the safe side, I opted to seal the Sandstone tiles with Tile Doctor Seal and Go Extra, which allows full moisture vapour transmission, making it fully breathable and ideal for these situations. It also provides durable protection against ingrained dirt and stains and does a good job enhancing the look of the tiles. The customers were very happy with the result, and left the comment below on the Tile Doctor Feedback system. 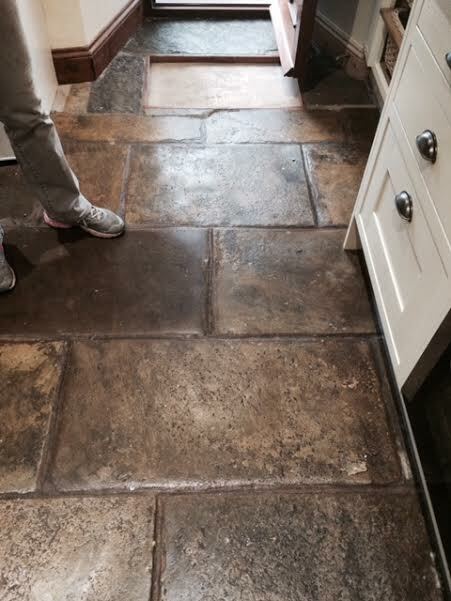 WONDERFUL, delight to have Trevor restoring my very tired flagstone kitchen floor, it is now beautiful. Many thanks Trevor a job very well done. 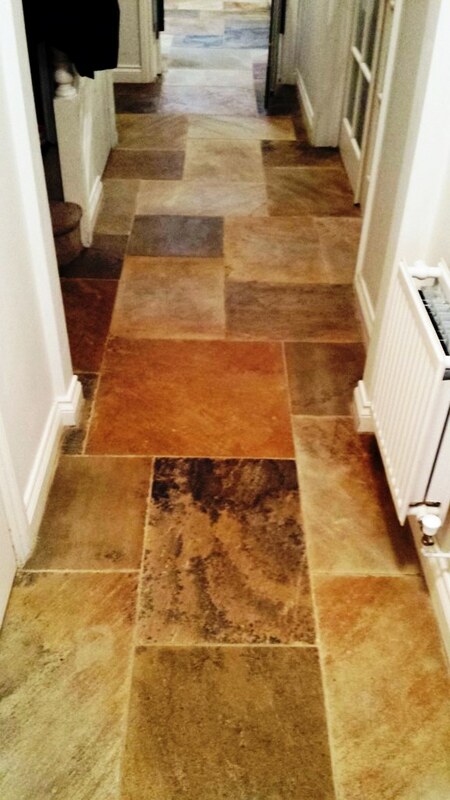 I’m sure they were also relieved that they won’t have to go to the expense of replacing their fantastic Sandstone tiled floor. What was Once a problem is now a real asset to the property. 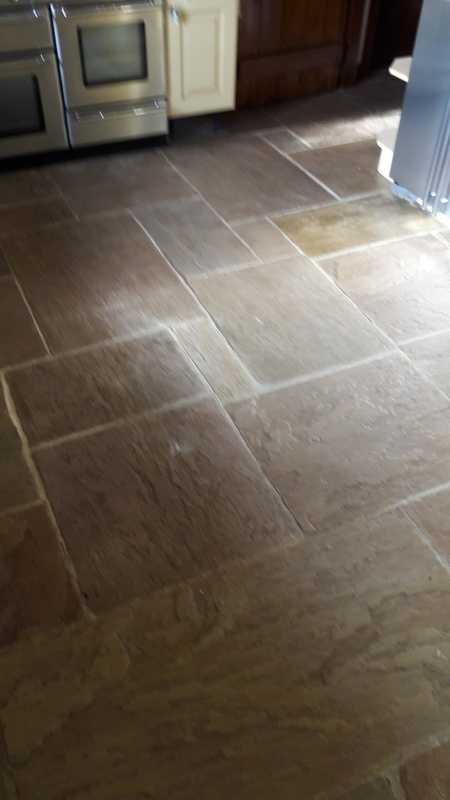 This customer living at a property in Deepcar near Sheffield, experienced problems keeping their twenty year old Yorkstone floor clean and I was asked to take a look and see what could be done to resolve the situation. 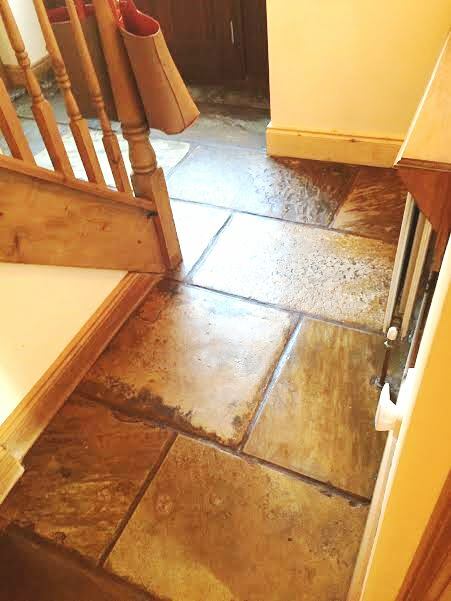 After inspection I could see that the sealer had worn off and now dirt had become lodged in the pores of the stone, leaving the floor looked grey and dull to the extent even the customer couldn’t remember that their stone floor had some colour once! 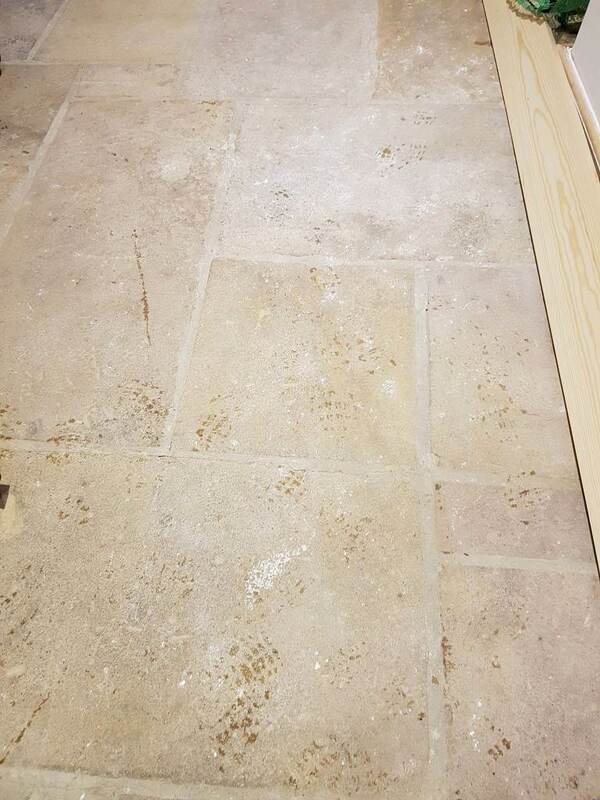 Due to all the problems the customer had with experienced with the floor, they had reached the point where they were thinking of ripping the floor up entirely. Luckily they had found Tile Doctor and I was more than happy to see what I could do to resolve the problem. 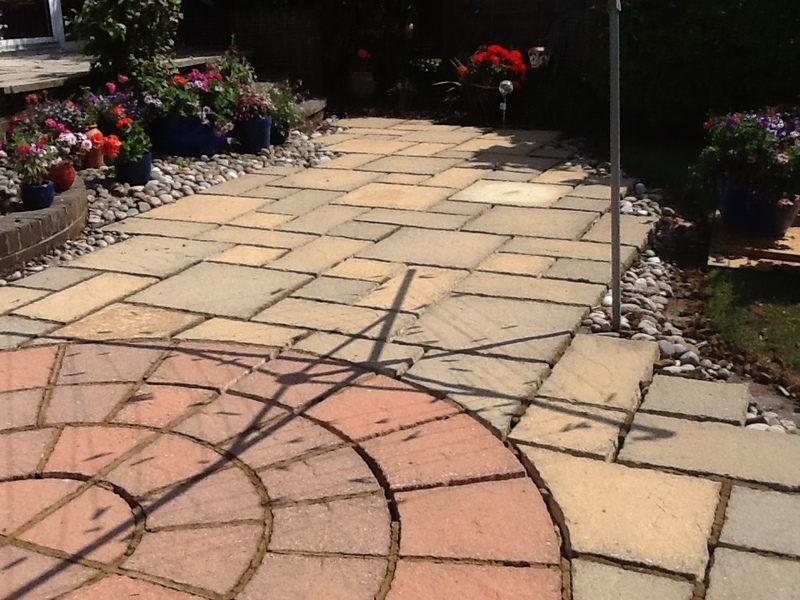 Yorkstone is similar to Sandstone which I was very familiar with, so I assured them the floor could be rejuvenated and conducted a test clean on a patch of the floor. Seeing the result, the customer was happy to go ahead with the work. 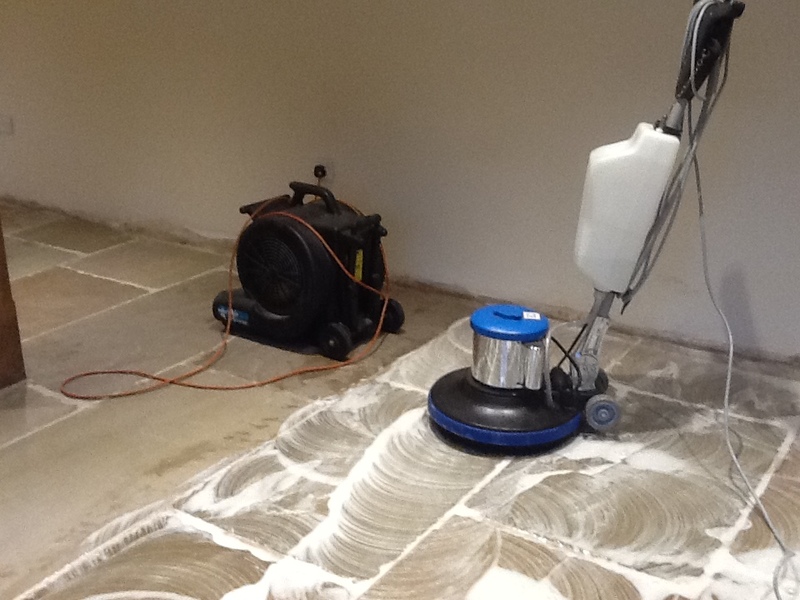 To clean the floor and strip away old sealers, I used a strong dilution of our alkaline cleaner known as Tile Doctor Pro Clean, working it into the stone with a black scrubbing pad fitted to my rotary machine. I followed by removing the dirty and chemical-infused water from the floor with a wet vax machine. Although this combination worked really well, I still found some light traffic areas where some of the old sealer remained. In order to restore a floor properly you have to strip the floor right back and remove all the old treatments from the floor otherwise the final result can look patchy and you may find the new sealer isn’t compatible with the existing. stripper and coatings remover, applied with a long dwell-time it can remove sealers, draw out ingrained stains and eliminate heavy grease build-up. I left the Remove & Go to soak into the stone for about ten to fifteen minutes before scrubbing it in with the black scrubbing pad, following again by removing the resulting slurry from the floor with a wet wax machine and rinsing the area with water. After the floor was successfully cleaned I carefully rinsed it again to get any trace of cleaning product off the floor and then dried it as much as possible with the wet vacuum. I returned to the property the next day, starting by making sure that the floor was completely dry for sealing. Unfortunately, there were some areas that were still very damp. I worked on these damp areas with my heat gun, but couldn’t get them dry enough, so after consulting with the customer, I decided to leave it to dry for another day with heating on maximum and doors/windows opened. Upon my return these problem areas were less severe, and I managed to get them dry by applying my heat gun for an hour. When the floor was ready to be sealed I applied six coats of Tile Doctor Seal & Go Sealer, which is a water based sealer (no smell) that provides durable protection and a high quality satin finish. 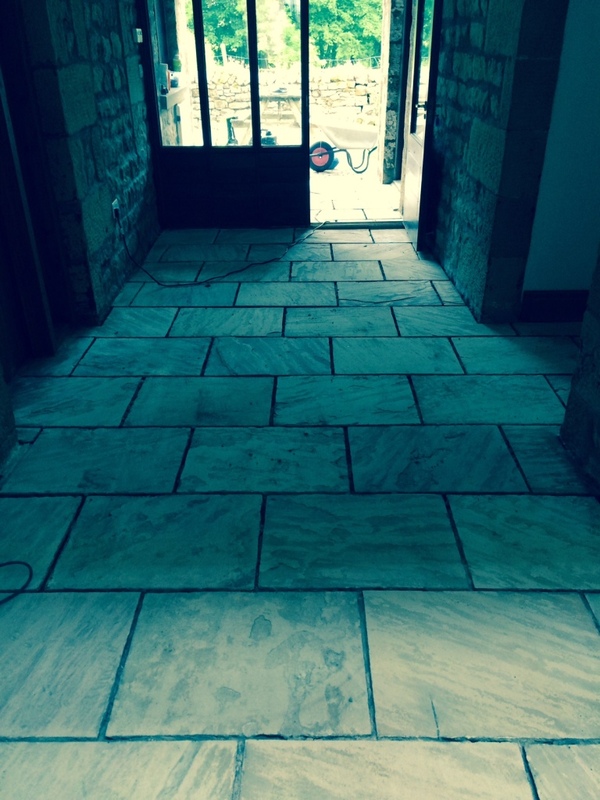 Here we have a six year old Indian Sandstone tiled floor located a property on the outskirts of Lancaster. Measuring 100 metres squared, the very large floor had under floor heating in the concrete sub base. 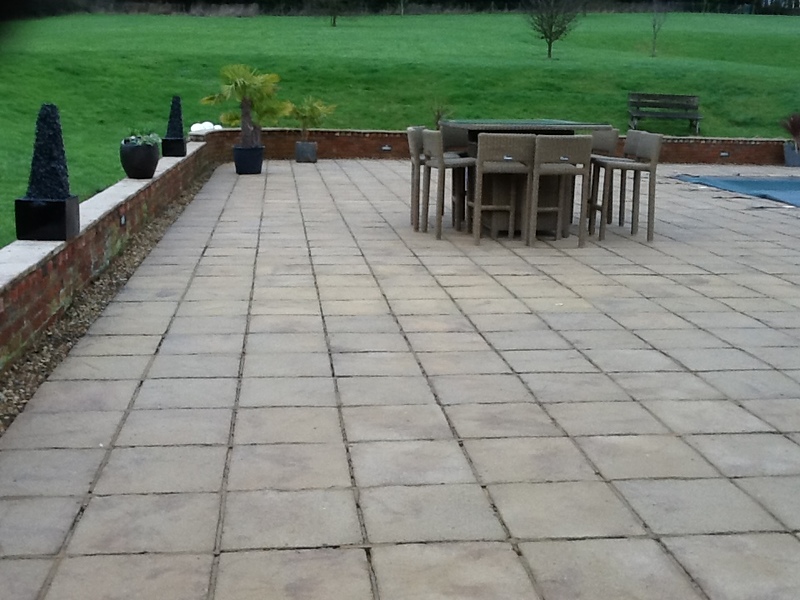 The type of stone used inside the property is what we commonly refer to as ‘patio Sandstone’, a material which is usually used outside because of its very rough texture. It’s not particularly comfortable to walk across in bare feet, hence why many people consider it be impractical for internal flooring. Nonetheless, the property owner was keen to make the rough textured floor as feet-friendly as possible for people walking over it. 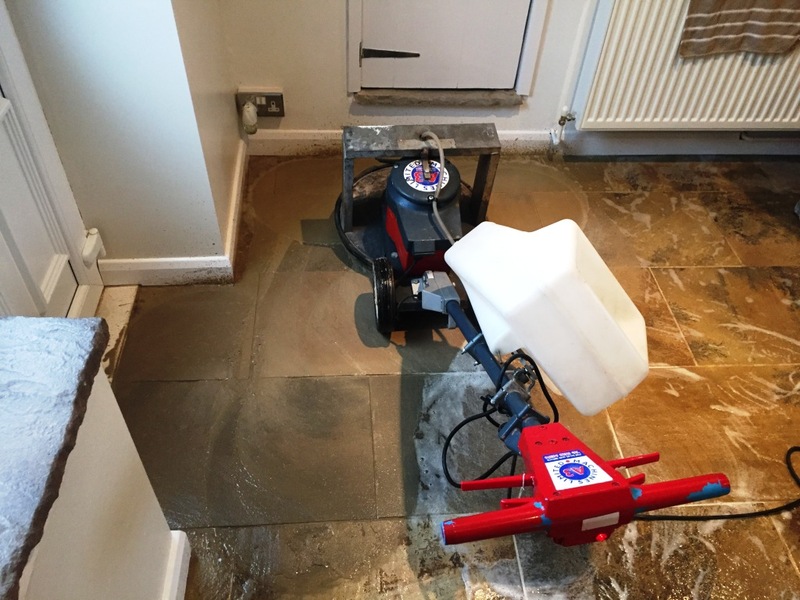 At Tile Doctor we have developed a process known as milling, which utilises diamond encrusted pads combined with a weighted rotary machine to smooth the rough surface, leaving it looking and feeling a lot nicer and more practical to live with. 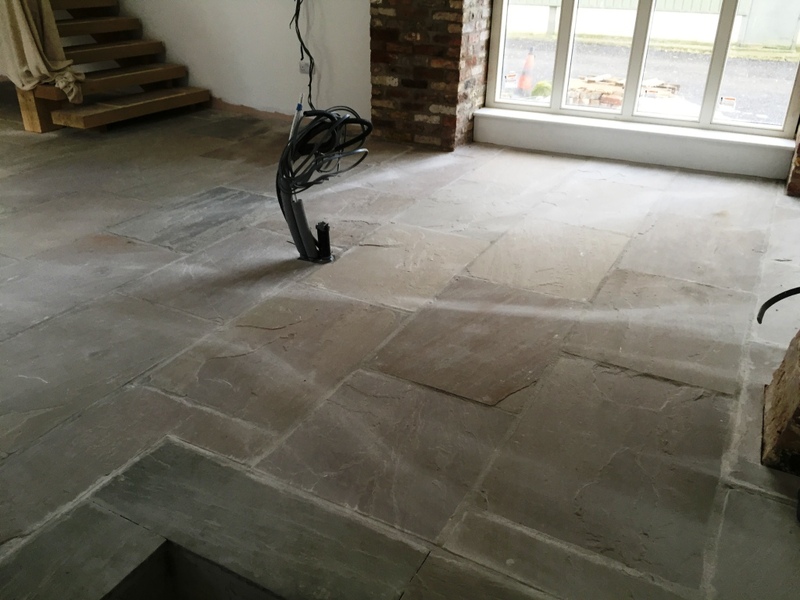 The milling process is only done once, but while the Sandstone will still need cleaning and sealing in the future, it won’t be nearly as difficult as when it was rough. 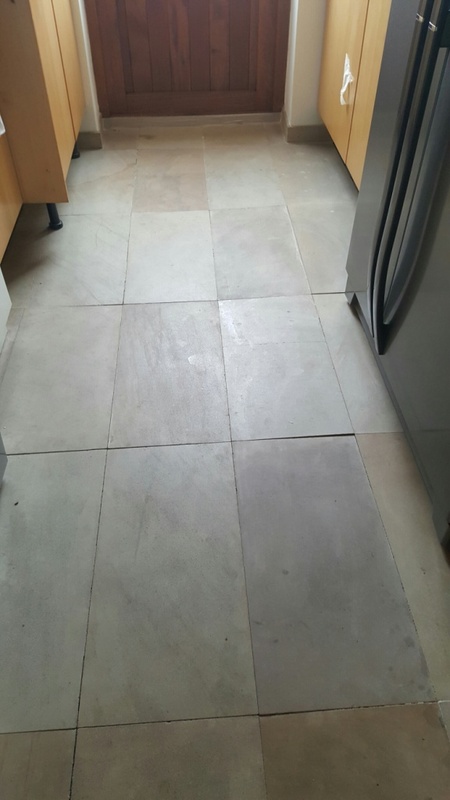 The job would take over two weeks to complete due to the fact that the existing grout needed to be removed and replaced with a flexible floor grout: a very time consuming process. As mentioned, the surface of the Sandstone was very rough, and so needed to be milled down to make it a lot smoother to look after and make it easy to clean and seal. This was achieved by using Tile Doctor’s 50 Grit diamond encrusted burnishing pads, fitted to a weighed rotary machine and run along the entire surface area of the floor. Through this process the stone became much smoother and more aesthetic – completing one of our main objectives for the customer. Next, we started breaking out the already loose and badly applied grout with our grout removal tools. The builder who had installed the floor had used a sand/cement-based grout which wasn’t flexible. 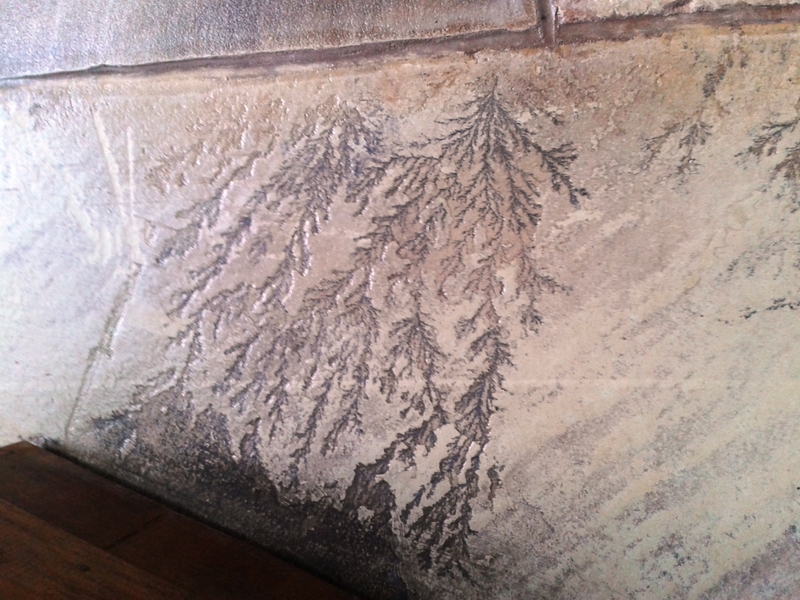 As a result, it started to crumble and loosen quite quickly after exposure to the underfloor heating. 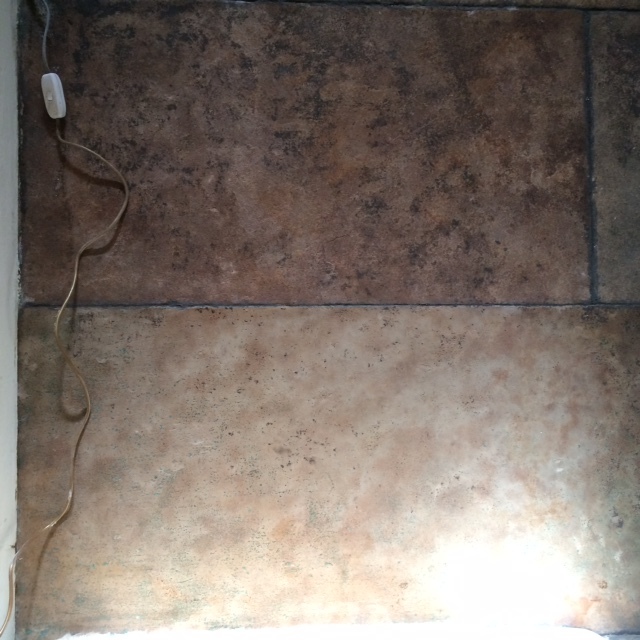 We removed this and replaced it with a far more flexible grout. 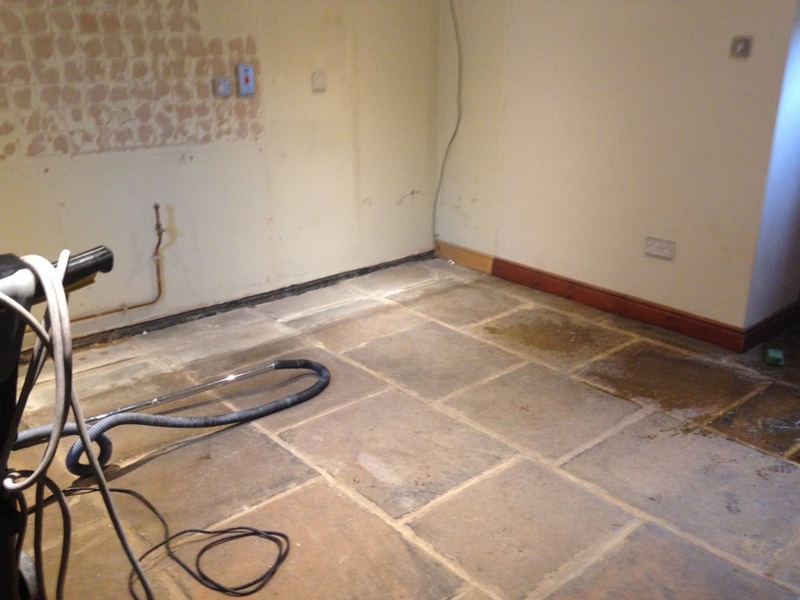 Once the whole area had been successfully milled and the grout replaced, the Sandstone floor was left to dry out over the weekend. Upon our return to the property, we cleaned off any dust and resin left over from the milling and grouting processes, before leaving it to dry for a further 24 hours. The next day we returned to seal the whole floor with two coats of our impregnating sealer Tile Doctor Colour Grow. 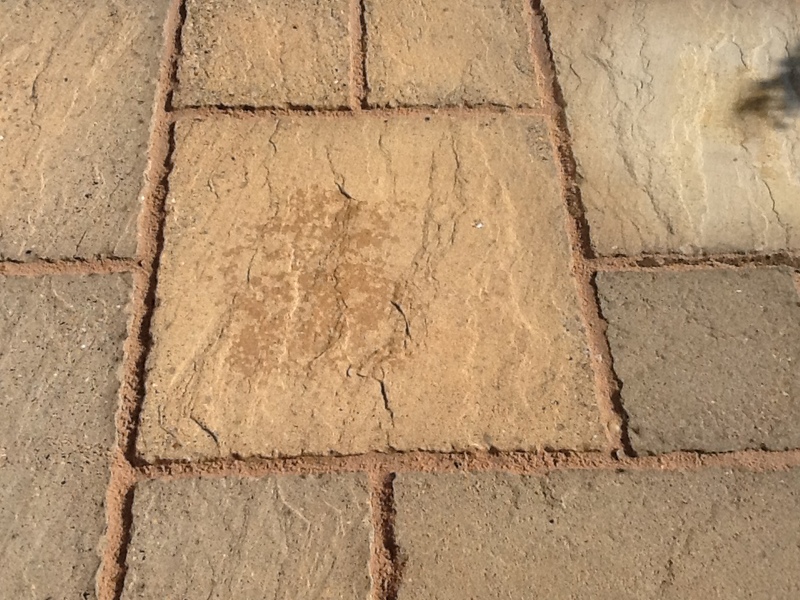 The sealer fills the pores of the Sandstone to prevent ingrained dirt and stains, while also emphasising the natural colours in the stone. It also provides a robust matte finish, which is what the customer wished for. 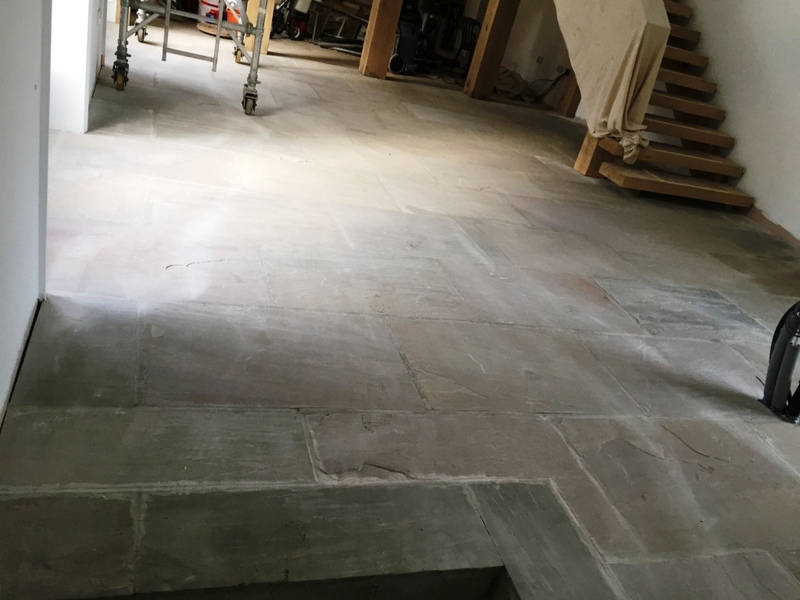 It wasn’t the easiest of processes to get the Indian Sandstone into a condition where it would be both suitable for internal flooring and aesthetically pleasing, but the results proved to be very much worth the time and effort invested. The customer was very pleased with the transformation. 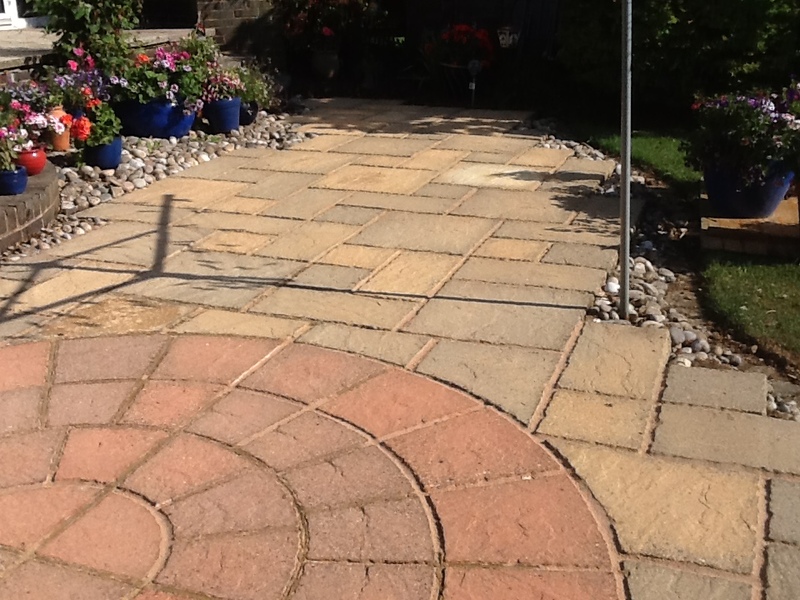 Yorkstone is a variety of Sandstone unique to Yorkshire, and is known for its hard wearing and durable qualities. It was first manufactured during medieval times, but is still used for a range of building and construction purposes including, of course, tiled floors in houses. 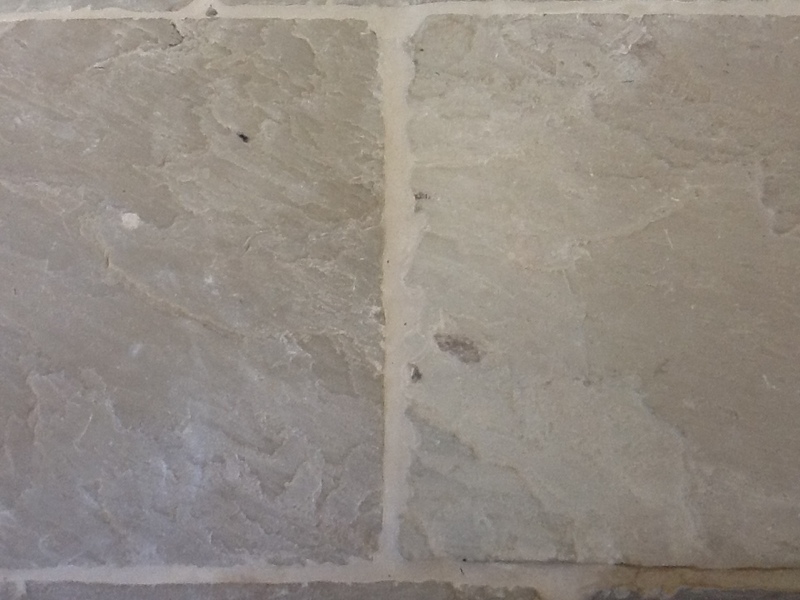 Yorkstone comes in a variety of natural colours, depending on the mineral makeup of the stone, and means that the tiled floors often have a unique look to them. 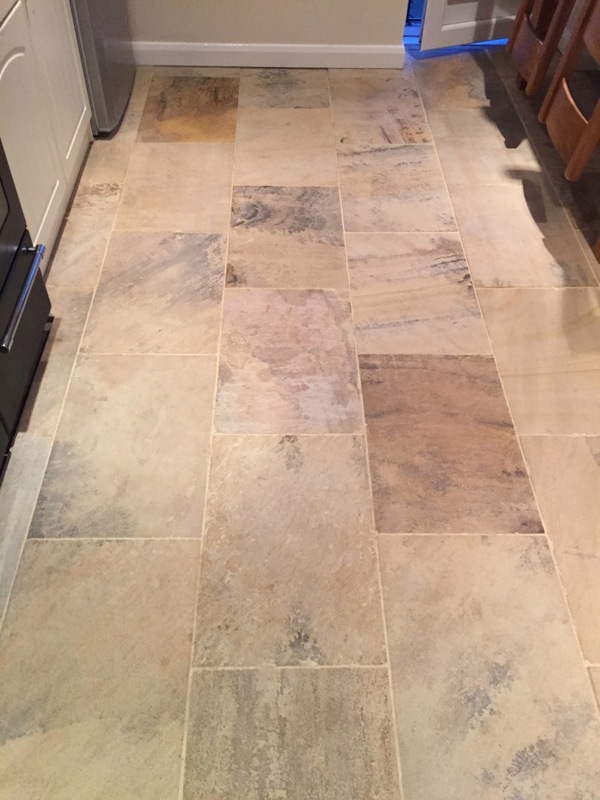 This customer, living in the small Yorkshire town of Driffield is the lucky owner of a fantastic new Yorkstone tiled living room floor. 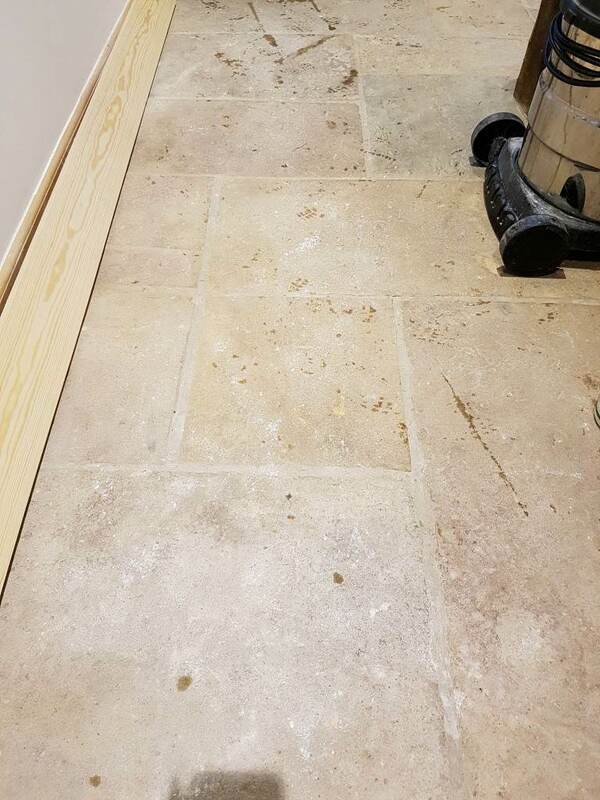 Unfortunately, the floor had been installed by an independent builder, as opposed to a professional tiling company, and had been left with no sealer to ensure it would stay looking great for a long time to come. 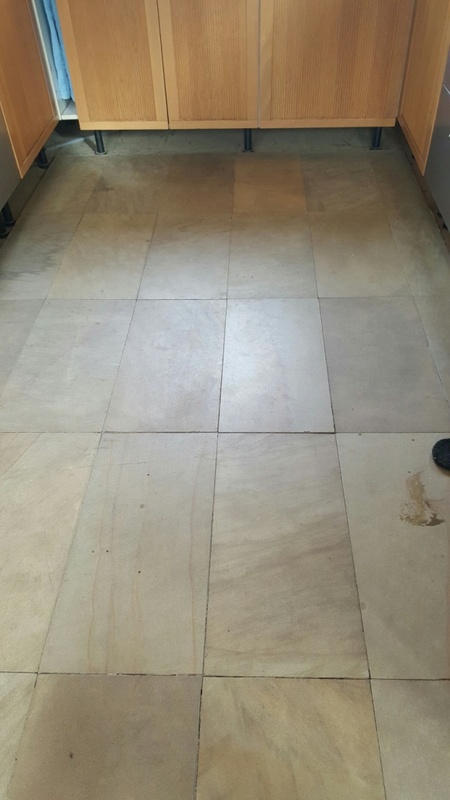 Over time, the lack of a sealer has allowed the dirt to become ingrained in the stone, making it increasingly difficult for the customer to keep the tiles clean. I was called in to bring completion to what was an unfinished job! As you can see from the photographs, the entire floor was quite dusty and dull looking following the recent installation. 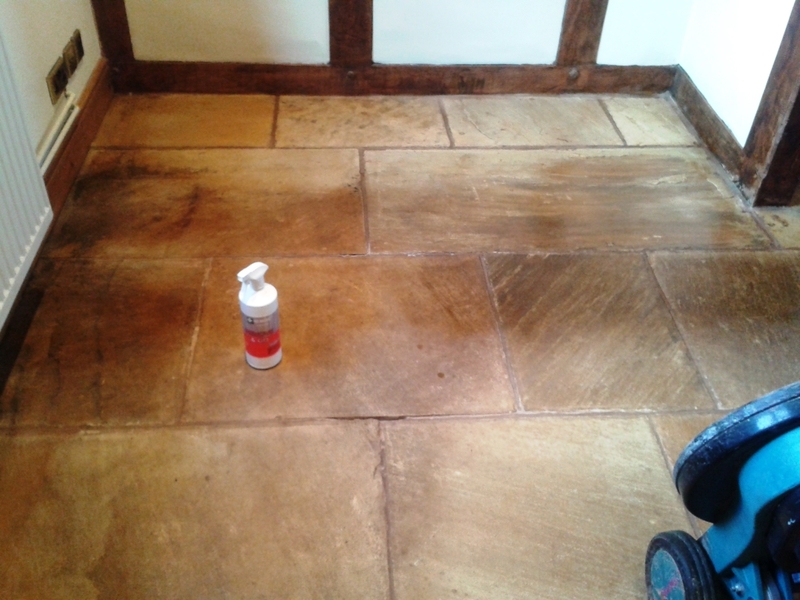 To get the tiles clean, I mixed a strong 60-40 mix of Tile Doctor Pro Clean and clean water. Pro Clean is a reliable alkaline cleaner suitable for use on most natural stone floors, including Sandstone, Quarry, and Slate. 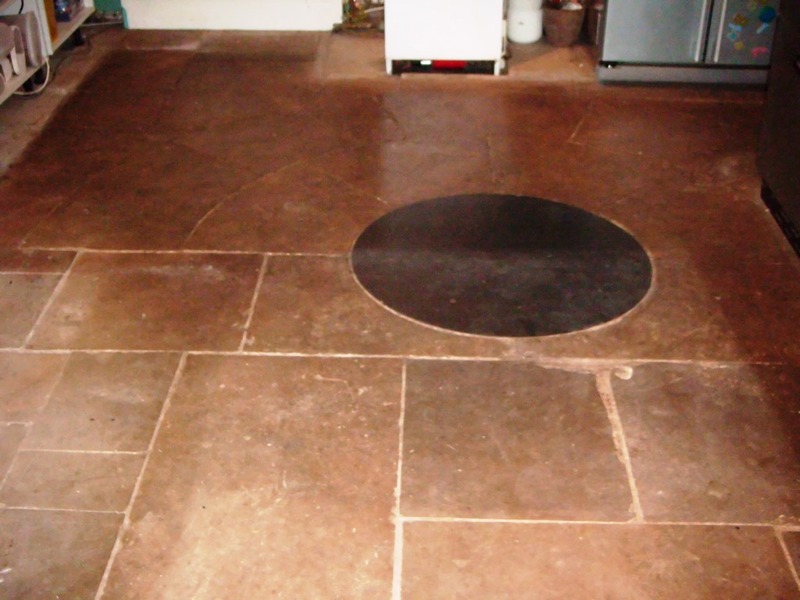 The cleaning solution was applied to the floor and left to dwell for 20 minutes, allowing it time to penetrate the stone. Then, using my 17” rotary machine fitted with a black scrubbing pad, I proceeded to deep clean the tiles, leaving them looking immediately cleaner and more vibrant. Any resulting cleaning residue was promptly soaked up using a wet vacuum. The process was repeated in the more stubborn areas, and I gave the floor a final rinse with water and left it to dry. 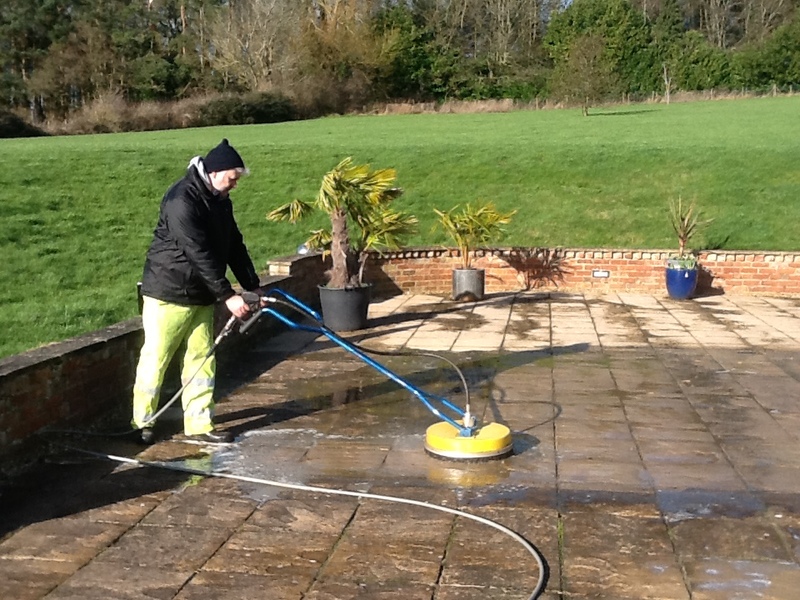 Typically, we would leave a 12 to 24 hour drying period, depending on whether there is a damp proof membrane installed. However, this floor had underfloor heating and so dried really quickly, allowing me to seal it on the same day. 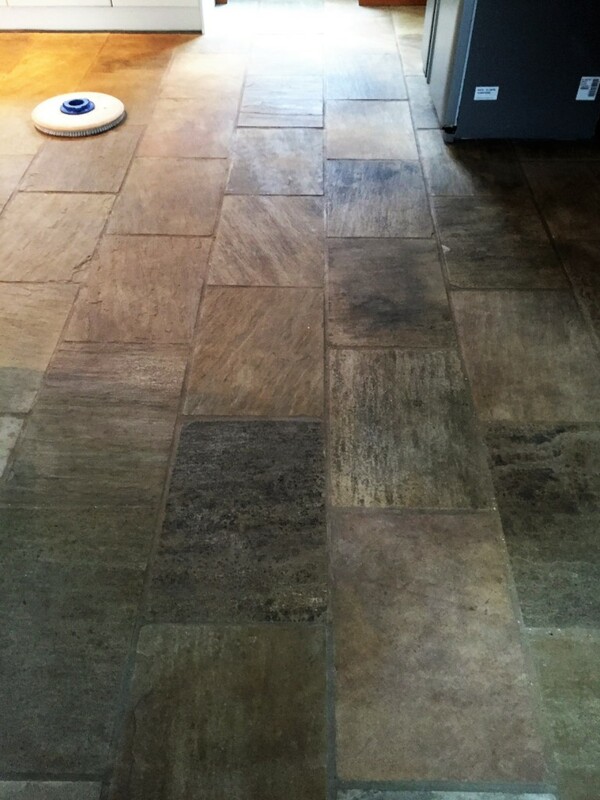 The customer wished to have a matt, natural finish for the Yorkstone tiled living room, so I applied two coats of Tile Doctor Colour Grow, our impregnating sealer which offers a natural, no-sheen look for textured floors, while providing durable protection against ingrained dirt and stains. As the name of the product suggests, Colour Grow contains colour intensifying properties which really helped to accentuate the rich variety of colours in the customer’s Yorkstone tiles. The results were fantastic and you can see from the water test we performed after the sealer dried how water now bubbles up on the surface of the stone. 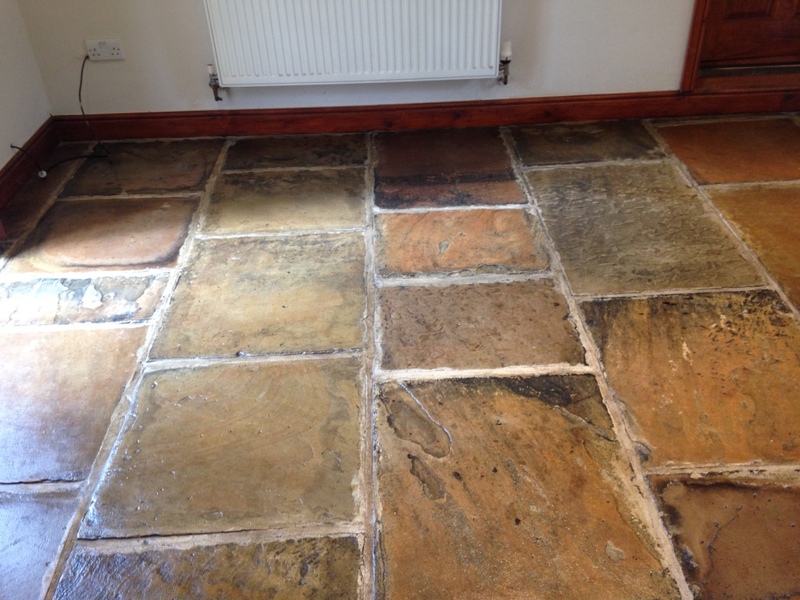 These Indian Fossil Sandstone tiles (sometimes known as ‘Yorkstone’ tiles) at a property in the small town of Swanland near Hull were, on initial inspection, in great condition, with no cracks or damaged tiles. 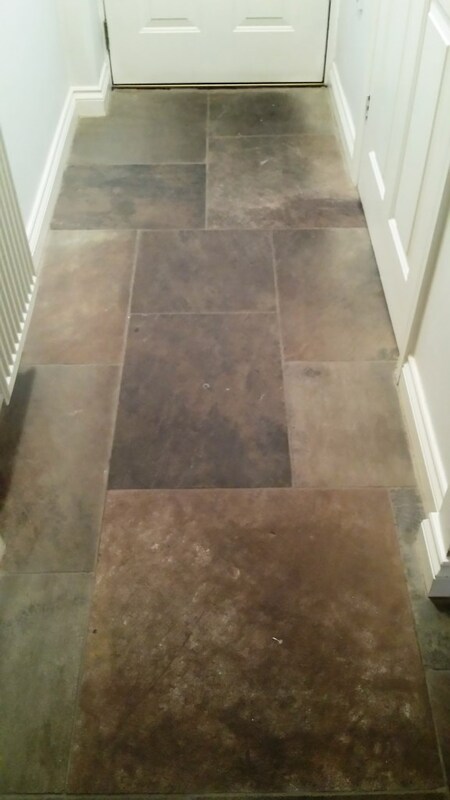 However, thanks to a lack of sealer, the tiles had become ingrained with dirt, resulting in a heavy soil buildup that dulled the appearance of the stone. Also noticeable were some unsightly cement splashes around the grout lines. 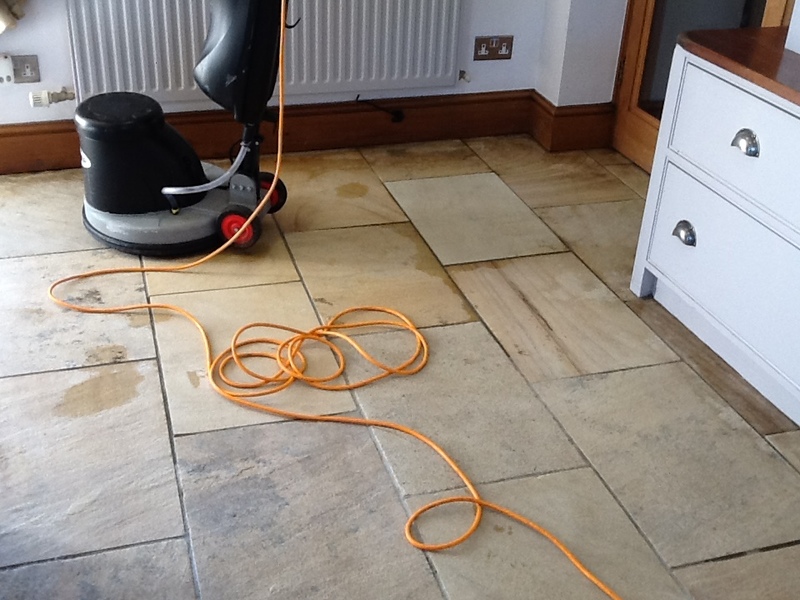 The property owner contacted me with the problem and I recommended that the tiles were simply in need of a deep clean and seal and after arranging a date I went over to carry out the job. I started the job by tackling the cement splashes around the grout lines. 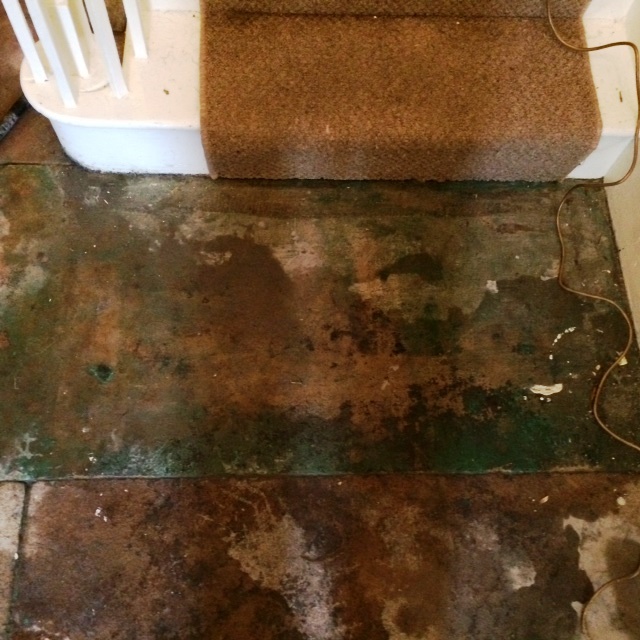 In this case I opted to carefully break them down manually using a good old fashioned hammer and chisel, whereas when it comes to stubborn adhesive and paint stains I would recommend a specialised cleaner such as Tile Doctor Remove & Go. 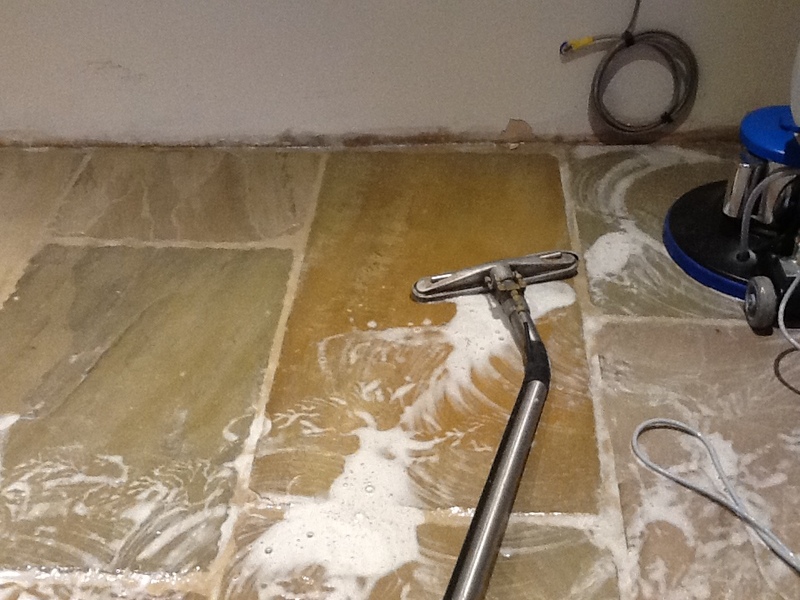 The first step of cleaning the main area of Sandstone tiles was to mix a solution of one part Tile Doctor Pro Clean to four parts water, before applying it to the stone and scrubbing it in with a black pad fitted to a rotary machine. This helped to break down the heavy soil build up, and is an effective method for doing so on most types of natural stone floor. 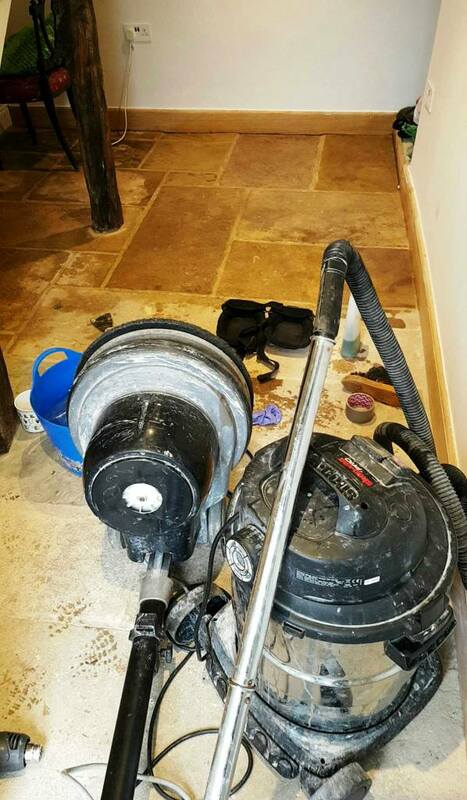 The second step involved rinsing the floor with Tile Doctor Neutral Cleaner to neutralise the floor (after exposure to the high alkaline Pro Clean) and remove the other products used to clean the surface. This also helped to shift any remaining ingrained dirt caused by a lack of sealer, leaving the tiles clean and ready to receive a new seal. After completing the clean, I left the property to allow the floor to dry overnight. Upon my return the next day, I checked for excess moisture and, once satisfied the floor was dry, I proceeded to seal the floor with four coats of Tile Doctor Seal & Go. Checking for excess moisture prior to sealing is essential as it can cloud the sealer and damage its performance. 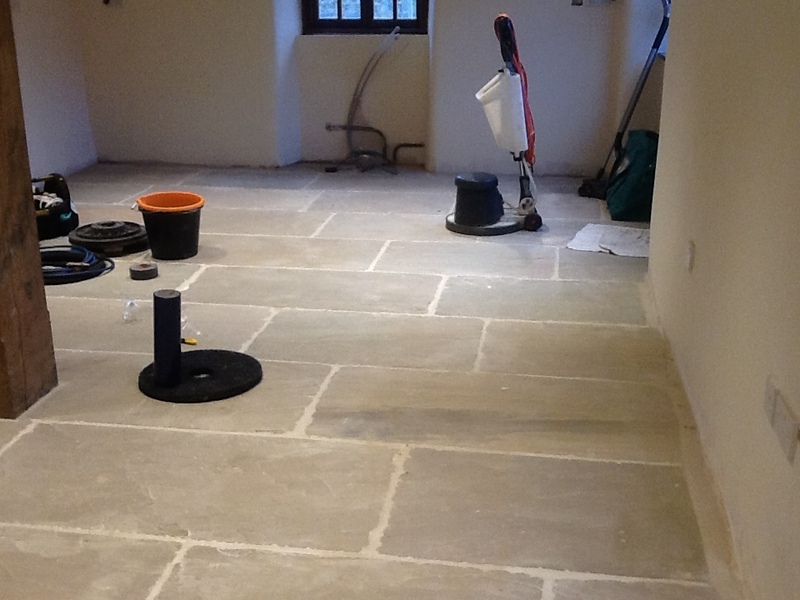 Quarry and Victorian tiled floors and being water based you don’t get a smell as it dries. 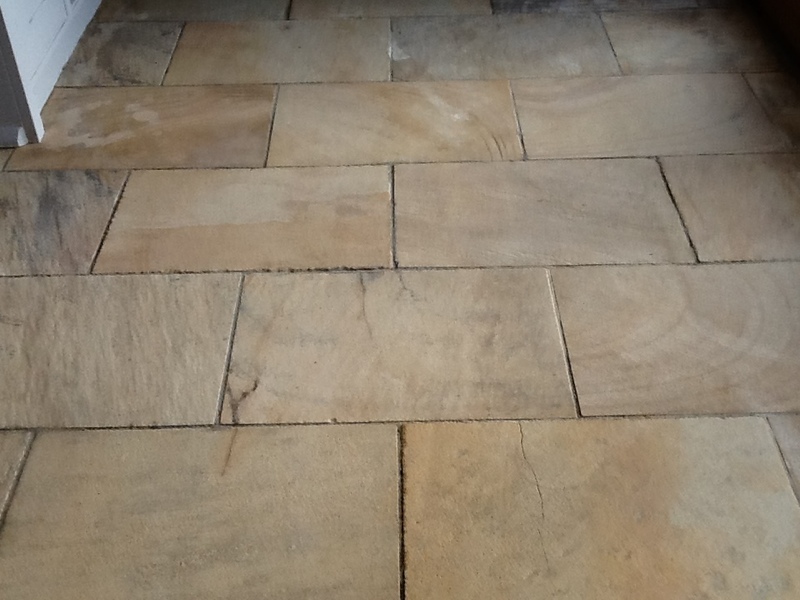 These once dull and dirty Sandstone tiles are now restored back to looking their best thanks to a deep clean. With the addition of a fresh seal, the tiles are protected against future soil build up and spillages, and have an aesthetically pleasing low-sheen finish. 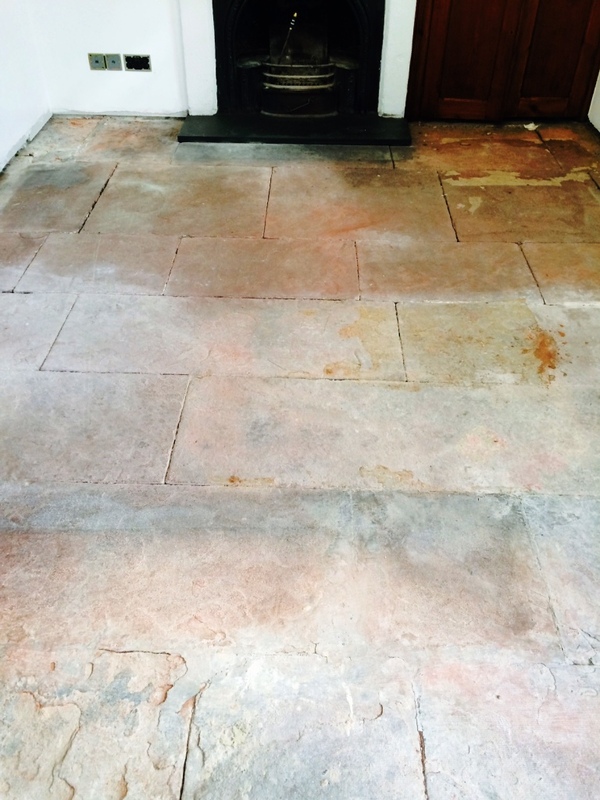 The Red Sandstone flagstones at this property in the historic market town of Kirkby Lonsdale had been covered with carpet and underlay and to make matters worse it had a screed level laid on top of the stone to make the floor smoother to walk on before the carpet went down. The current owner of the property had discovered the floor under the carpet and was now keen on having it restored back to its former beauty as a period feature. 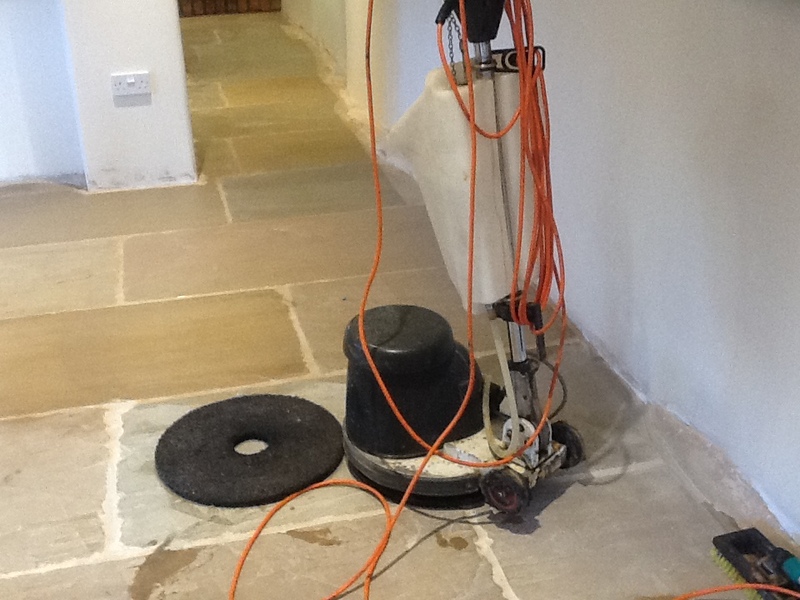 Stone is difficult enough to restore with the conventional chemical approach as it is so instead we opted to use a full diamond pad cutting system which is designed to cut back the screed to the stone underneath. This involves applying a very coarse 50 grit Diamond pad, followed by a 100 Grit and so on to the 200 grit. As you can see from the results this not only removed the Screed/Self levelling compound but also revealed the true red colour of the Sandstone. We had to leave to the stone to dry out for several days as the diamond system uses a lot of water to lubricate the process which can saturate the stone making it take longer to dry out. 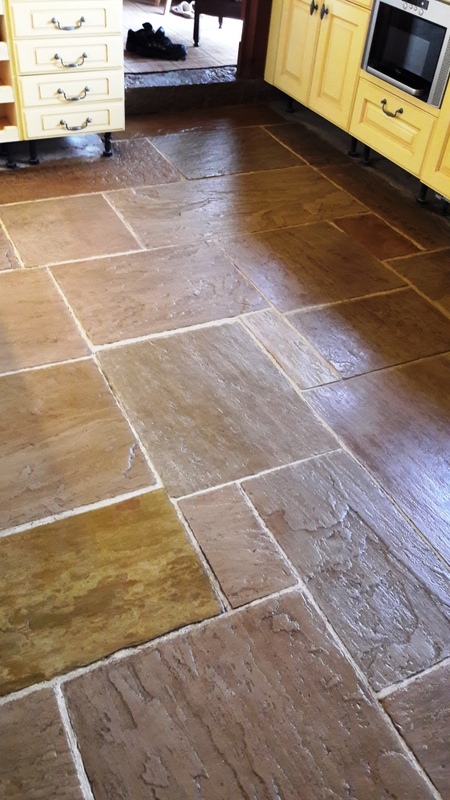 Once fully dry we applied three coats of Tile Doctor Colour Grow for a nice even matt finish, colour grow also accentuates the deep colours in the natural stone. I think you will agree; this was quite the transformation. 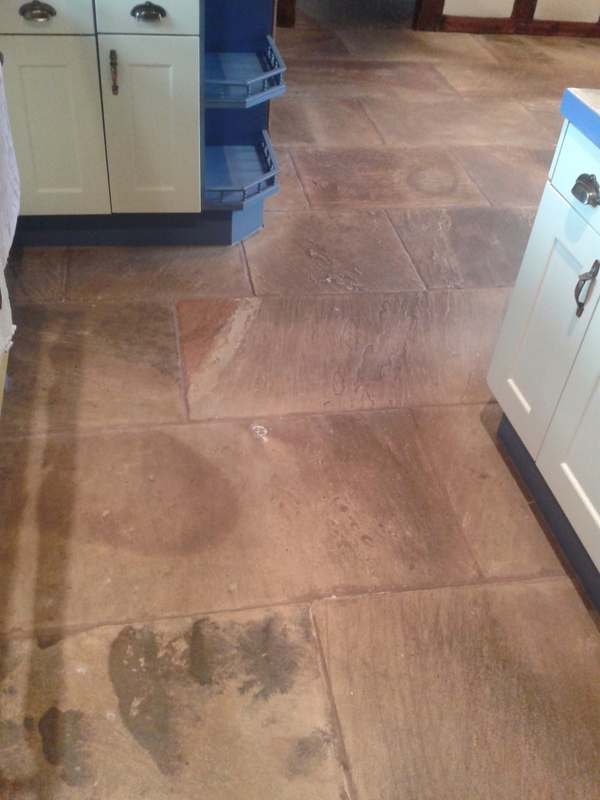 The pictures below are of an Indian Fossil Sandstone tiled floor at a house in the small town of Hessle which as you can see was in a need of a deep clean and seal. The tiles themselves where in good physical condition with no cracks, just a lack of sealer and a heavy build up of dirt. I started the job by dealing with some unsightly cement splashes that had been left around the grout lines, breaking them down manually using a good old fashioned hammer and chisel. Once that was taken care of step one was to mix a solution of one part Tile Doctor Pro-Clean to four parts clean water, applying it to the tiles and scrubbing it in with a black pad fitted to a rotary machine. The second step involved rinsing the floor with Tile Doctor Neutral Cleaner to neutralise the floor and remove any trace of product used to clean the surface. 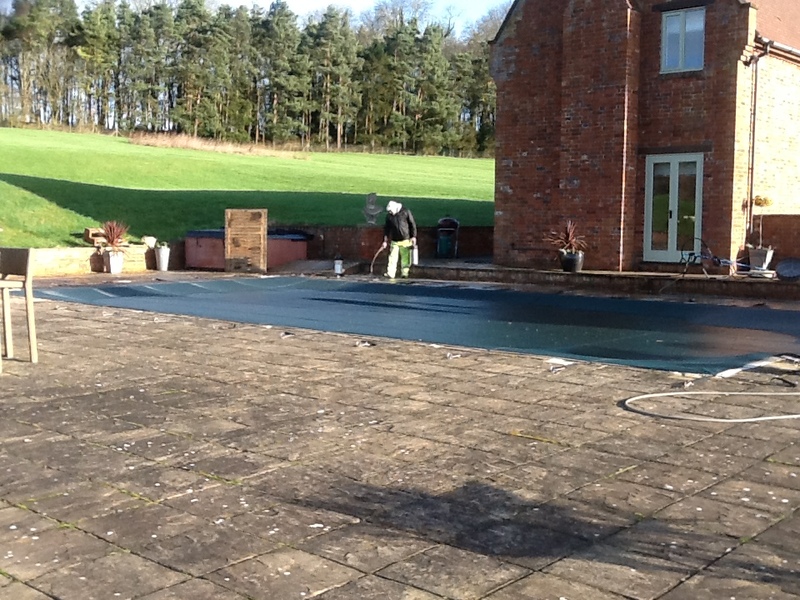 This process removed the ingrained dirt caused by a lack of sealer and clean the area ready to receive a fresh seal. I left the property to allow the floor to dry over night. Upon my return the next day, I checked for excess moisture and, once satisfied the floor was dry, I proceeded to seal the floor with four coats of Tile Doctor Seal & Go. Seal & Go is a water-based topical sealer designed to build up stain resistant protection on the surface of the floor and to allow moisture vapour transmission. It is typically used to seal internal, unsealed porous surfaces, including Sandstone, Quarry and Victorian tiled floors. Tiled floors are a popular choice for people with large household pets – particularly dogs. Compared to carpeted floor they are hard wearing and reasonably easy to keep clean, with the right methods. 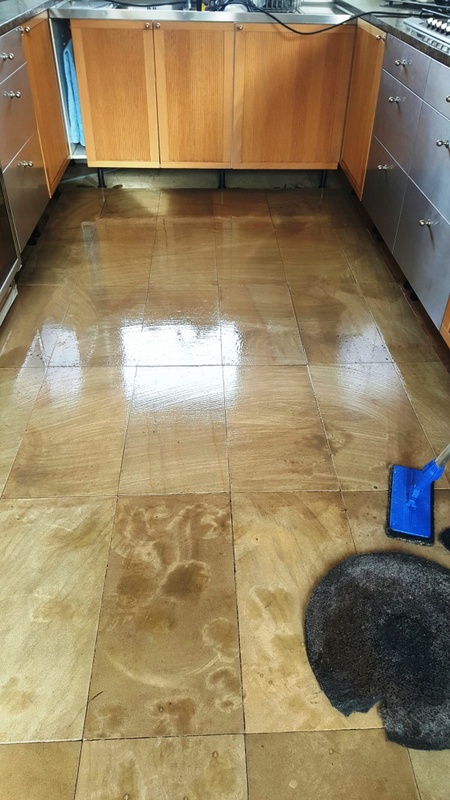 At this property near the Northamptonshire village of Brockhall, my customer’s Sandstone tiled floor had been very badly stained thanks to her two large dogs – a problem exacerbated by the fact that the tiles had not been professionally cleaned or sealed for a very long time. If you have read some of my previous posts you may remember a post detailing the cleaning of a large Sandstone patio with swimming pool, well this kitchen belonged to the same customer, who was so impressed by the results that he opted to have the kitchen cleaned as well. 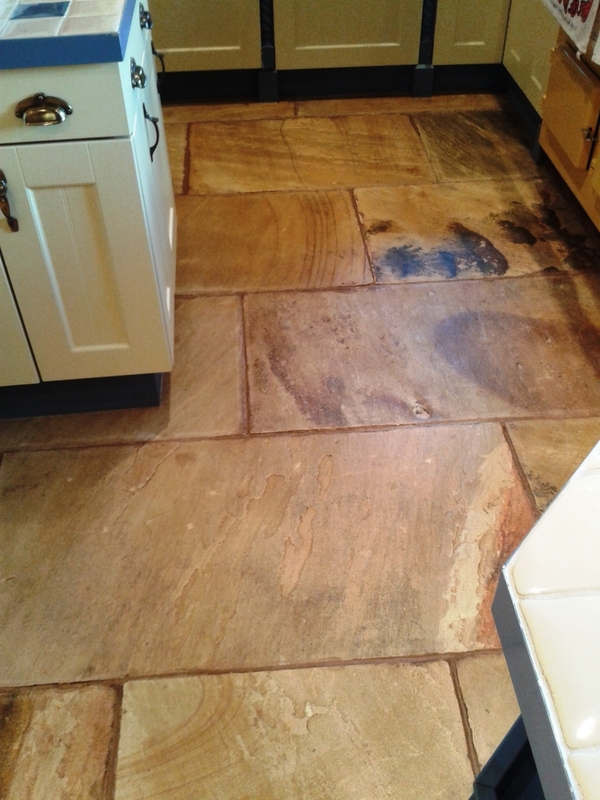 As the photographs below show, my first course of action was to apply Tile Doctor Remove & Go to the edges of the floor. Remove & Go is a powerful stripper designed to break down layers of old sealer and dirt, along with any adhesive and paint marks. It can be used to great effect on most types of natural stone floor. I did this before I unloaded the rest of my equipment, since the product needs time to dwell. The edges were then cleaned carefully by hand so as not to damage the customer’s painted kitchen units. Following this, I divided the room into four separate sections and, working one section at a time, applied Remove & Go before agitating it with a black stripped pad fitted to a rotary machine. The resulting slurry was promptly soaked up using a wet-vac machine. 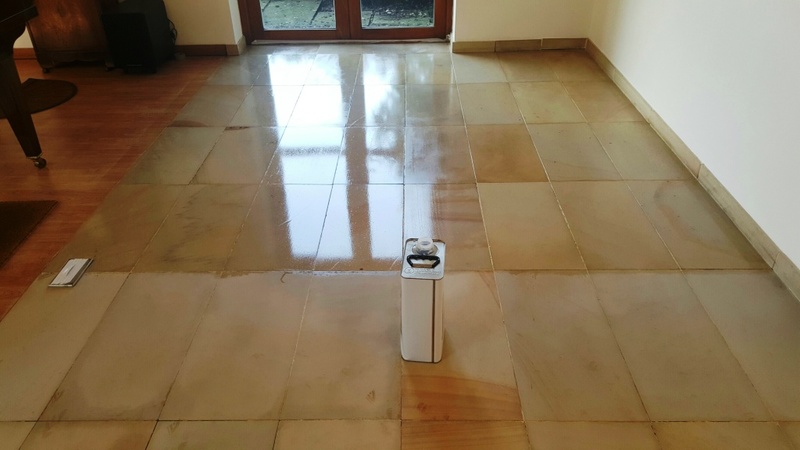 Certain areas proved particularly difficult to get clean, so in these cases I repeated the process once over, before following up with an application of Tile Doctor Pro Clean, worked into the stone with a scrubbing brush on the rotary machine. I rounded off the cleaning process with a second wet-vaxing. After being thoroughly cleaned, the floor was left to dry, with process being sped up using an industrial fan left on site overnight. 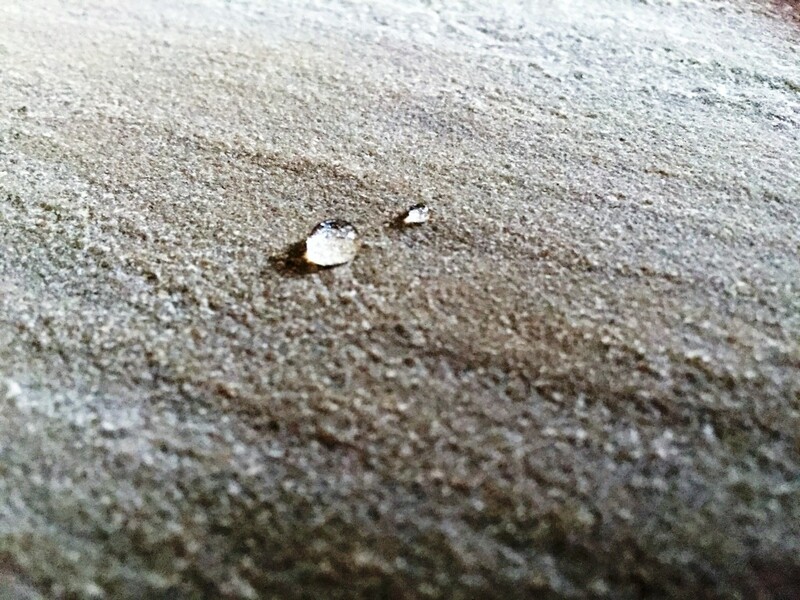 Adequate drying is essential as excess moisture can damage the performance of freshly applied surface sealer. I returned to the house the next day and ran some quick tests to check the floor had dried completely. 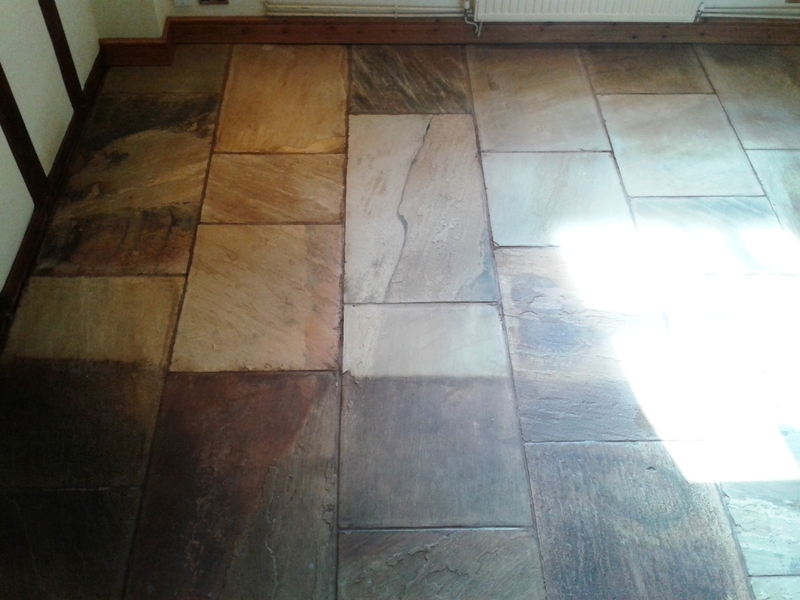 Then, to accentuate the subtle natural shades in the Sandstone, I sealed the floor using two coats of Tile Doctor Colour Grow. This colour intensifying sealer improves the appearance of natural stone one step further, while also providing a long lasting and robust surface seal. It is also important that Colour Grow can provide a matt finish, as a sealant which offers a gloss finish would not have been as hard wearing, especially with two large dogs roaming around. My customer was very pleased with the results. 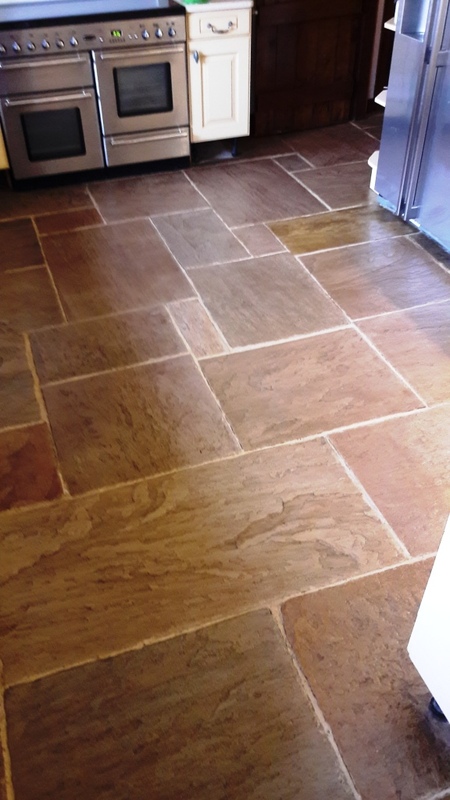 He can now enjoy his great looking Sandstone tiled kitchen floor, reassured in the knowledge that its rejuvenated appearance will be protected long-term against future dog-related stains and soil. 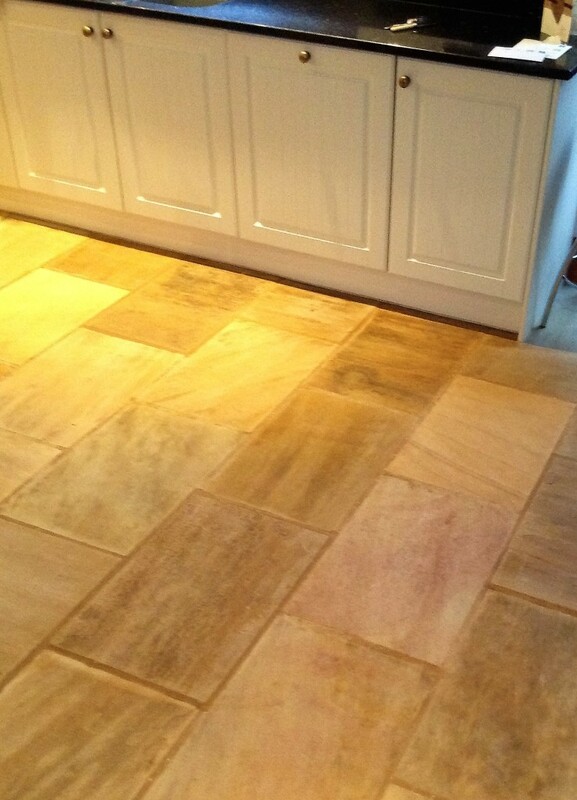 Sandstone is a particularly popular choice for kitchen and hallway floors amongst home owners in the UK. 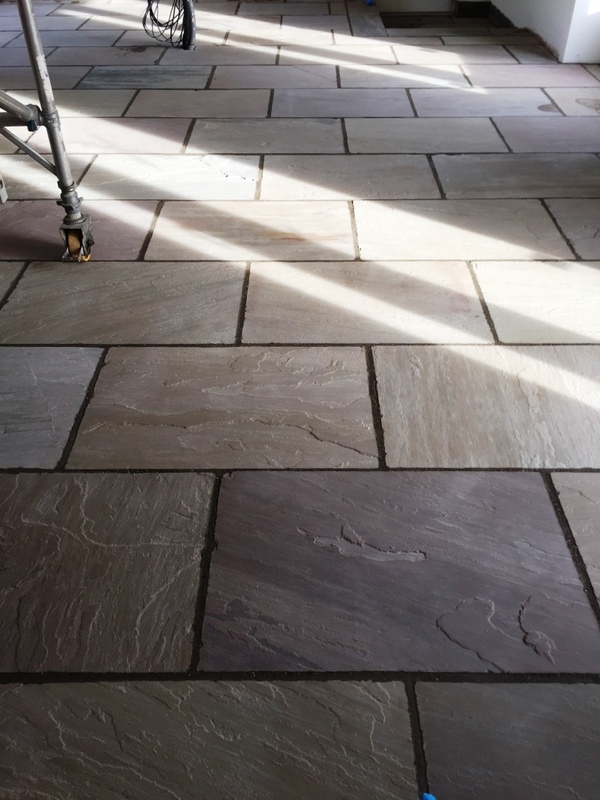 It not only possesses beautiful natural shades and features, but it is also typically hard wearing, making it an ideal stone for tiled flooring in high traffic areas of a house and can often be found laid as large riven flagstones in pubs and other commercial premises. 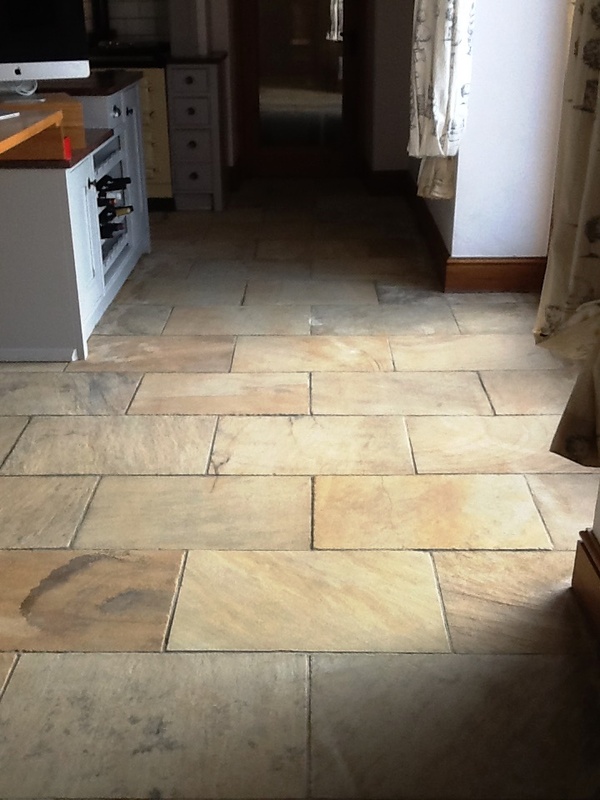 Naturally, just like any other type of tiled floor, Sandstone needs to be maintained using appropriate products and methods. 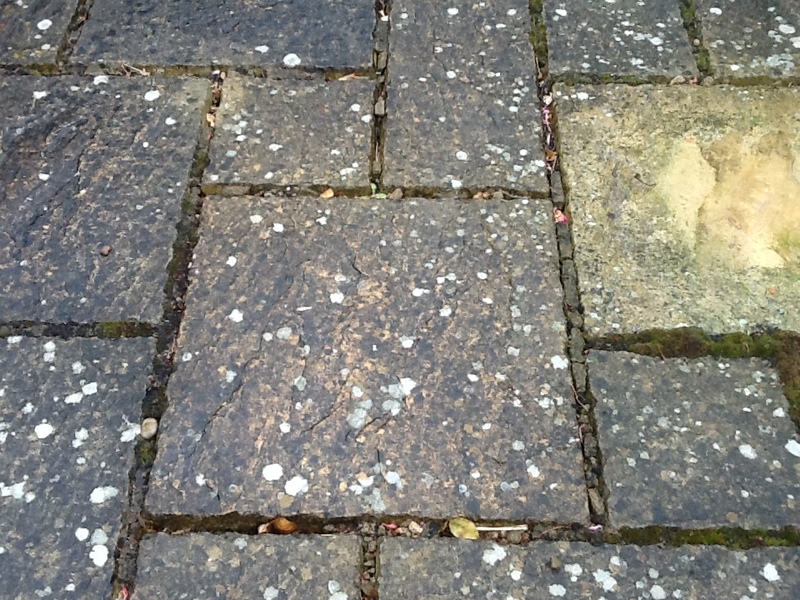 A lack of adequate surface sealer in particular leaves Sandstone susceptible to ingrained dirt, and can leave distinct, unsightly patches such as those in the photograph below. 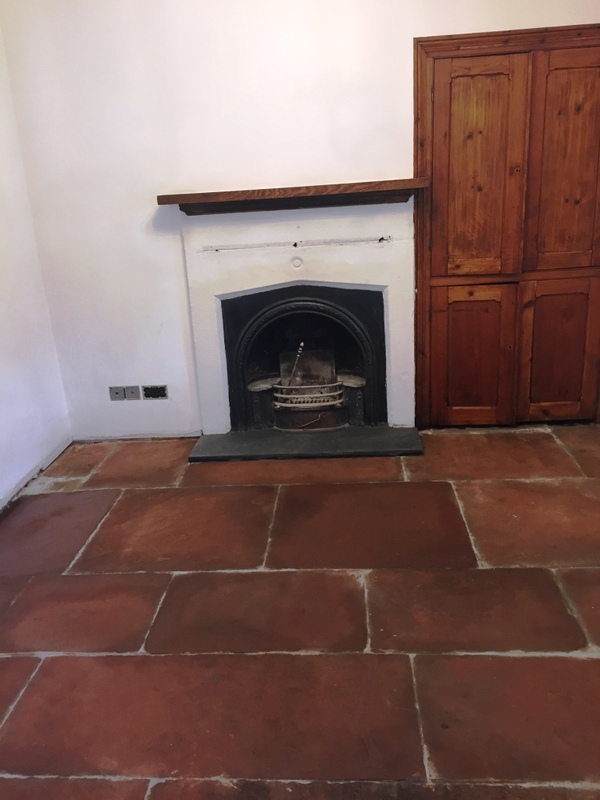 In this instance, I visited a client in the old Essex town of Thaxted, who believed that her four square meter Sandstone tiled floor might be suffering from damp issues after lifting up the mats covering the area. However, when I arrived at the property and ran damp tests, I found the issue to be superficial. 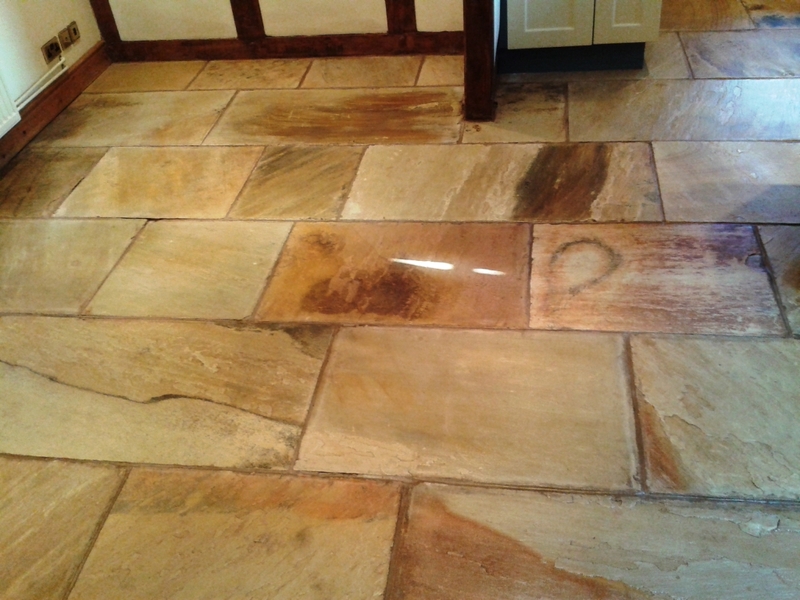 The Sandstone floor however did require attention in the form of a deep clean and a fresh seal to tackle the white patches and prevent further discolouration. 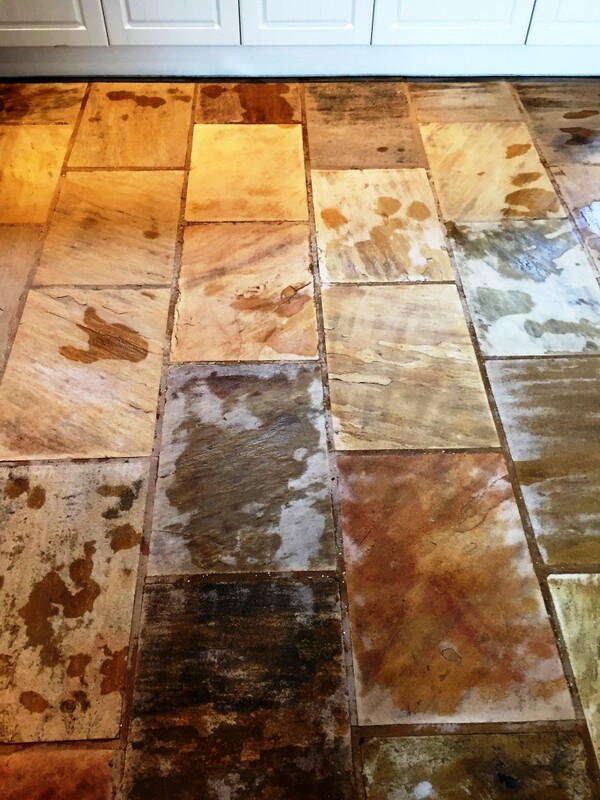 To begin the cleaning process I spread Tile Doctor Remove & Go evenly across the floor. It was left to dwell for approximately 15 minutes, during which time it worked to break down the old sealer remaining on the tiles. 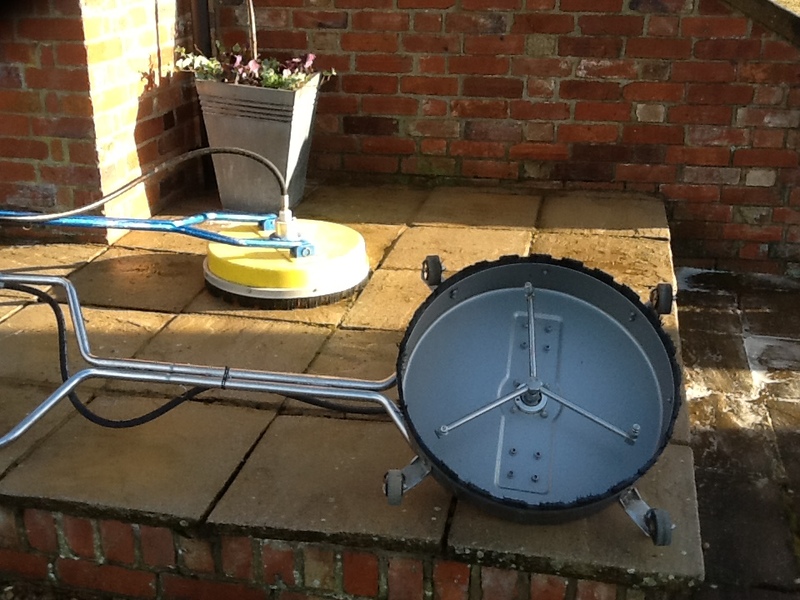 I then agitated the area twice over with both a black scrubbing pad fitted to a rotation machine lift away any dirt. 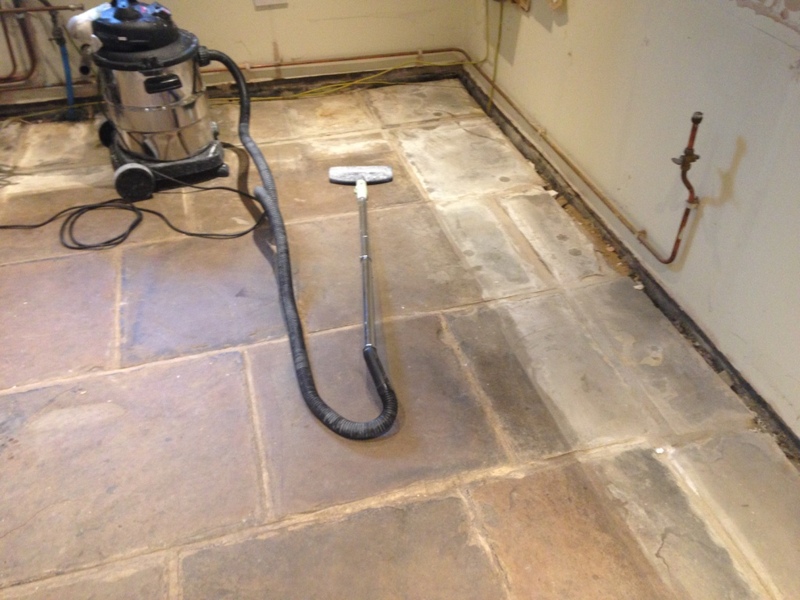 The resultant slurry was removed using a wet vacuum and the floor was then rinsed with water and then mixed a strong solution of one part Tile Doctor Pro Clean to three parts water which was used to give the floor a final clean and scrub the grout clean before using the wet vacuum again and giving the floor a final rinse with water. After completing the cleaning process I left the floor to dry over the weekend. Upon my return to the house I proceeded to seal the tiles with three coats of Tile Doctor Colour Grow which is an impregnating sealer that soaks into the pores of the stone and provide durable surface protection going forward. 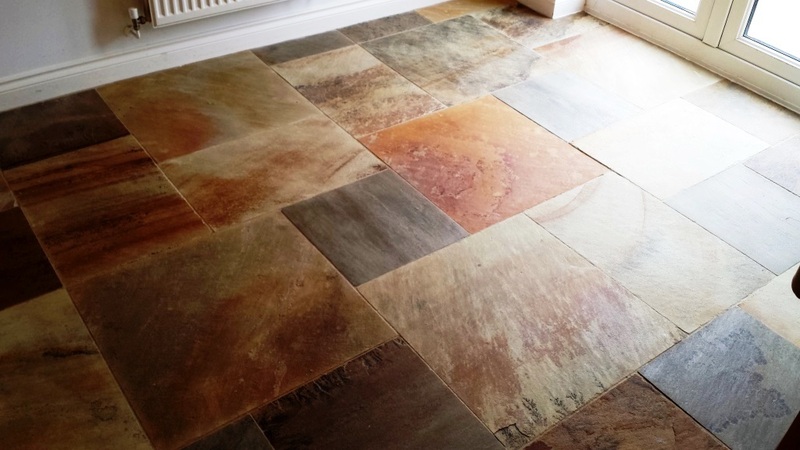 Colour Grow is also specially designed to let the floor breathe and enhance the natural colours in the stone and, in this case, really helped to intensify the natural sand-coloured shades in the tiles. 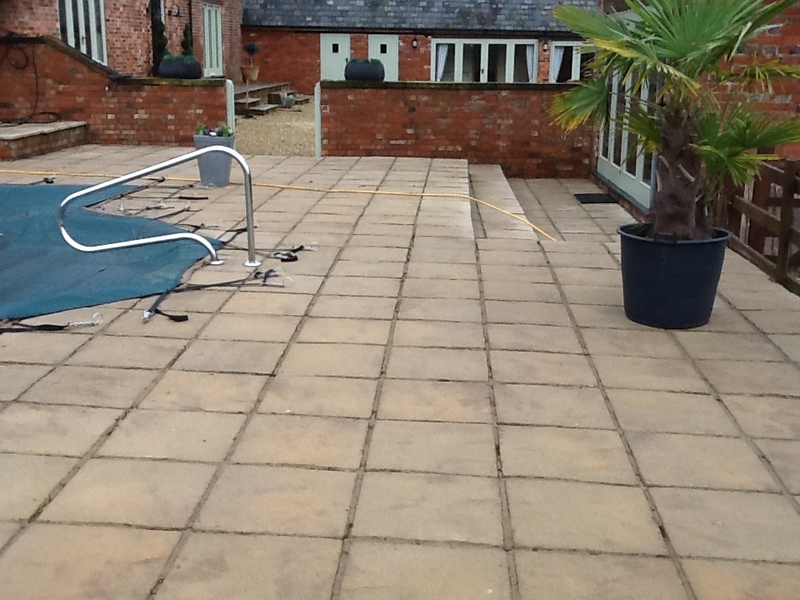 The difference made to these Sandstone tiles was really noticeable, with the white patches completely removed and the surface more generally back to looking like new, needless to say, my client was very happy with the results. 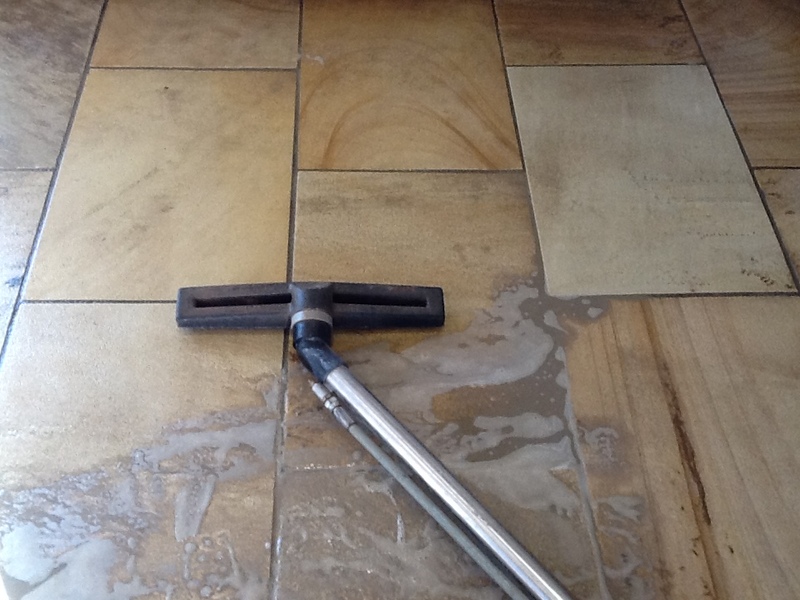 It’s not that uncommon for newly installed tiled floors to suffer from grout haze. This occurs where builder or tiler fails to remove all the excess grout from the surface of the tile after installation. It’s not always immediately obvious as the grout has to dry before it shows up and if the tiles are sealed afterward the grout is trapped on the surface of the tile under the sealer which makes it even more difficult to remove. 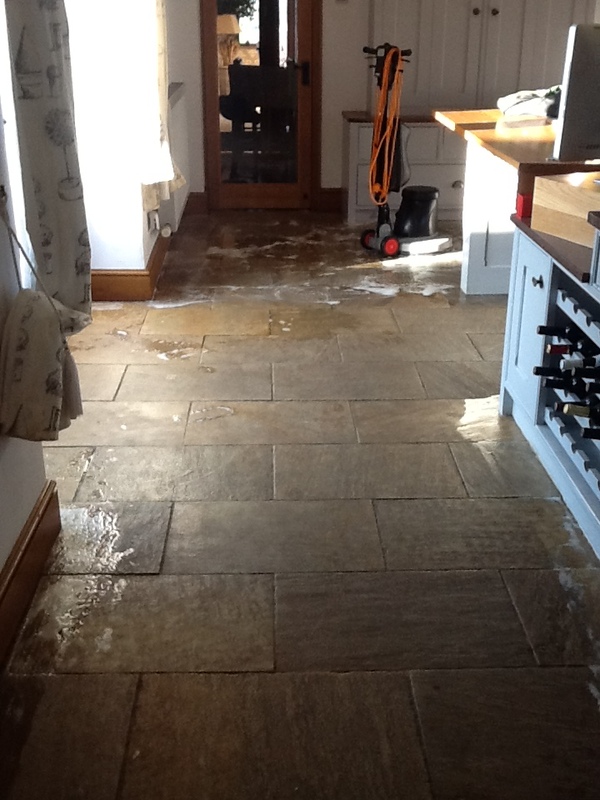 Not too long ago, I was called to address this exact problem experienced on my client’s Sandstone tiled floor at her house Wappenham, Northamptonshire. 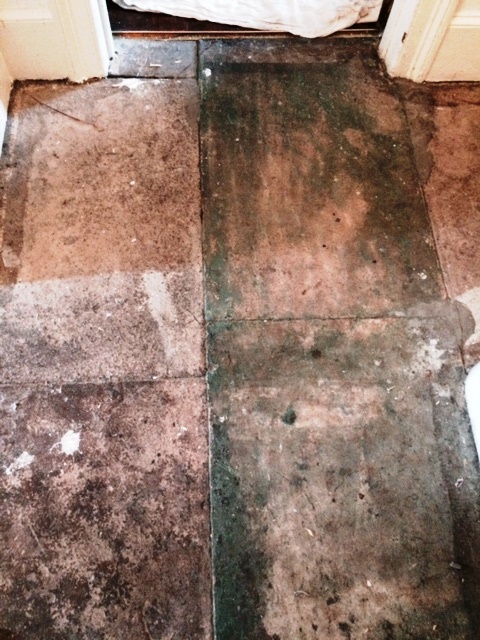 This first picture shows how the builder had left the floor after sealing (note how all the tiles have a similar colour). Also shown in the picture is the equipment I use to remove grout haze should you wish to do this yourself. 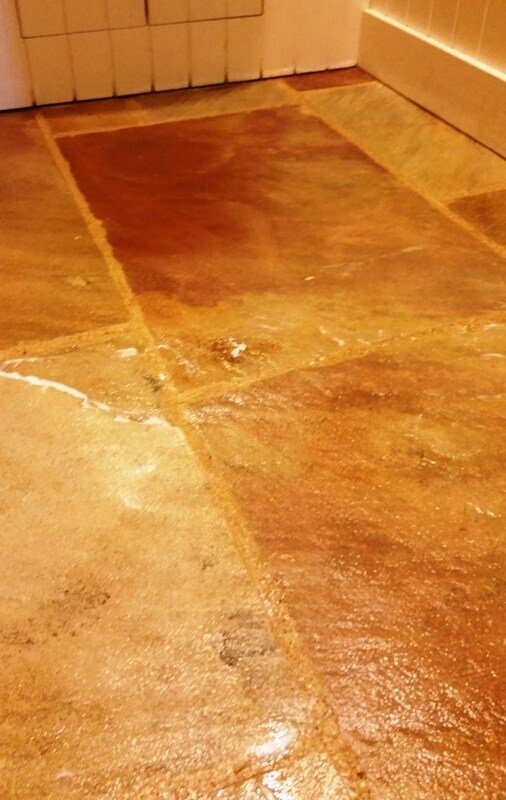 The second picture shows a close-up of the white grout haze deposits on the surface of the tile; the issue is probably difficult to appreciate if you haven’t come across this type of problem yourself however you will find ordinary household cleaning products will be largely ineffectual. The third picture shows the first stage of the cleaning process which required stripping off the sealer so I could then treat the Grout Haze. To do this I applied Tile Doctor Remove & Go liberally across the floor, before agitating with a black stripping pad fitted to a rotary machine to break down the old surface sealer. I followed this by using a wet-vac machine to remove any soiled residue. As you can see in the next photograph, the colours are already starting to show. 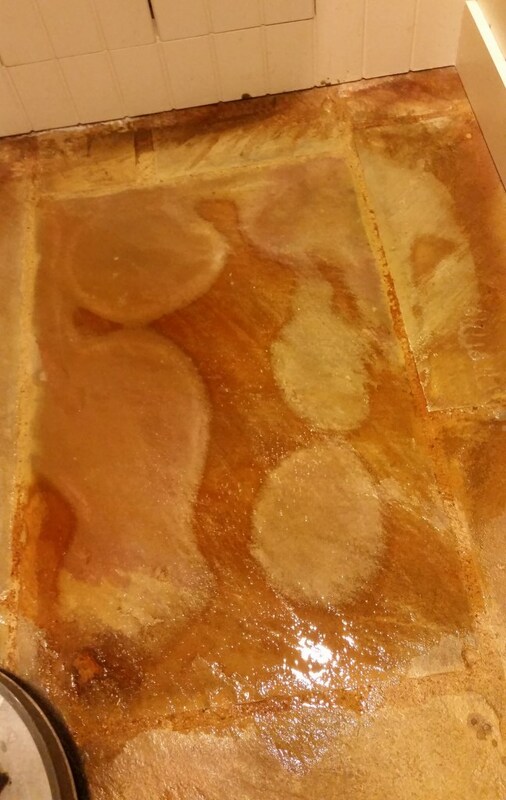 The next photo shows the second stage of the process, which involved the application of a new product in the Tile Doctor range called Acid Gel. The acid based formula is required to remove the cement/grout and being a gel you find the product remains in situ breaking down the grout haze instead of spreading around as you would expect with a liquid. I left the Acid Gel to dwell for approximately ten minutes, before mixing it with water and scrubbing it into the tiles with an industrial brush. This was followed by a second wet vacuum to ensure all the residue was removed. 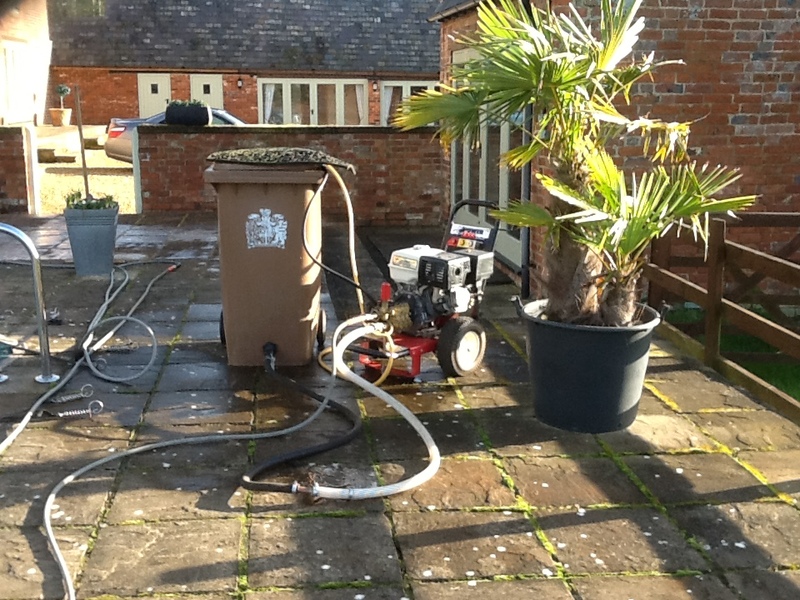 A turbo dryer was used on the treated area to speed up the drying process whilst I moved onto the next section. Once the floor was fully dry I was able to seal it again with a couple of coats of Tile Doctor Colour Grow. 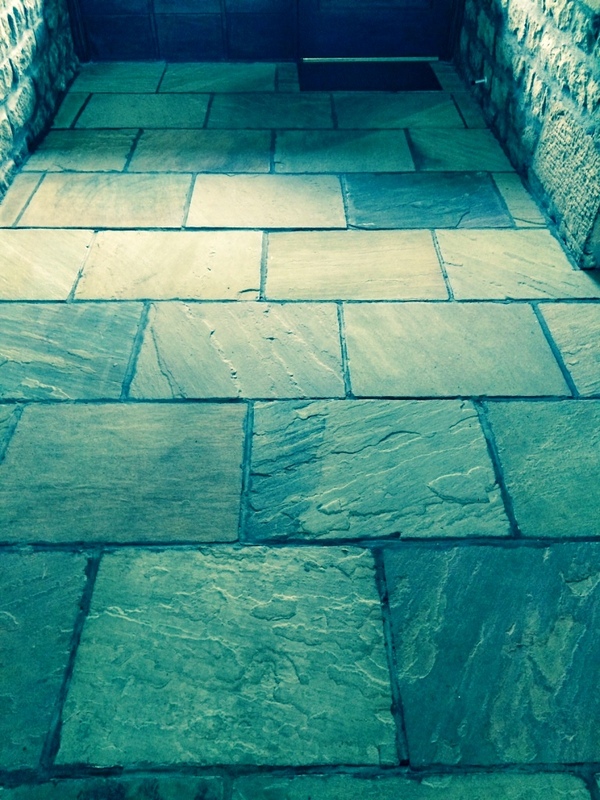 Sealing will protect the floor from staining and make it easier to clean, additionally Colour Grow soaks into the pores of the stone protecting it from within and enhancing the natural colours of the stone in the process. 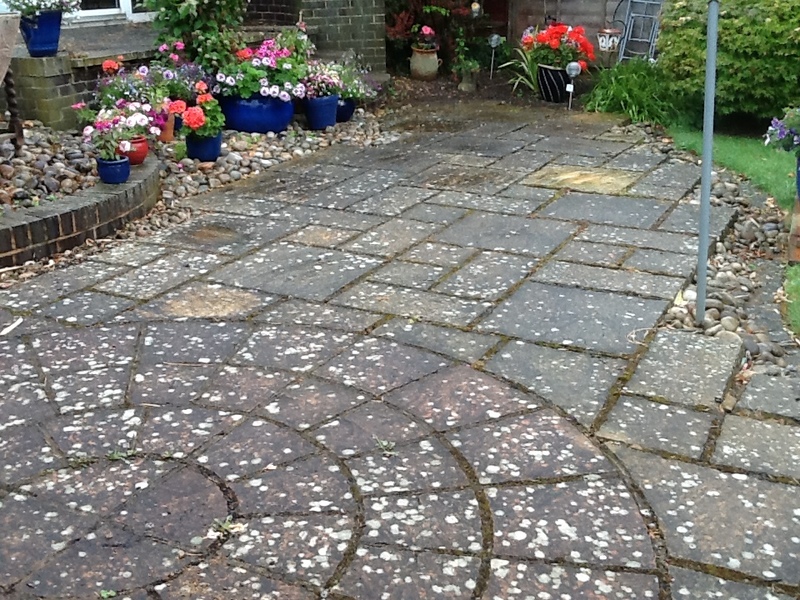 The final photograph shows an area which has been fully sealed and the tiles restored to their natural beauty. I achieved this result across the entirety of the floor. Here’s an interesting job that I recently completed down in Penrith, a small market town just under three miles from the Lake District National Park. 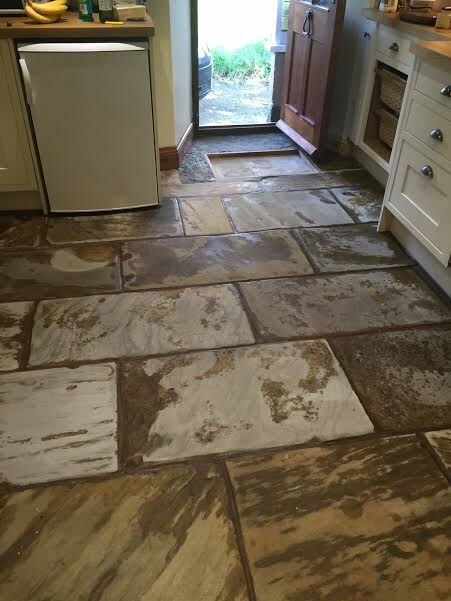 My client had a Sandstone tiled flagstone floor in her kitchen which had been continually sealed over its lifetime – but without removing the old sealer first. 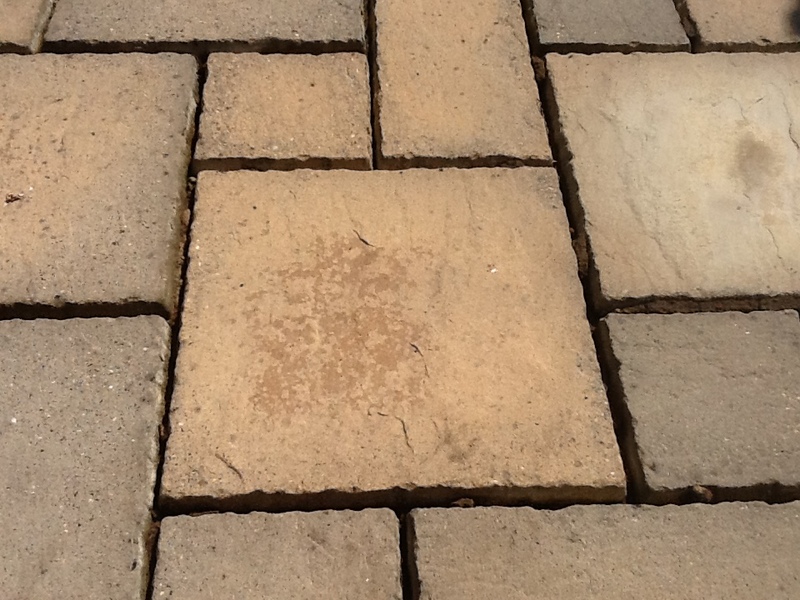 This is not advised, as it can lead to a severe problem where the layers of sealer become compacted on the surface. The result is a significant build-up of old sealer which is almost impossible to remove, even with some of the best and strongest products available. This problem is particularly acute in Sandstone because, as a naturally porous stone, it has a high grab factor when it comes to polyurethane type wax sealers. As a result, it would take me a significant amount of work to reduce the problem as far as possible. As no chemical products would prove effective in resolving the issue, I opted to use a milling technique using abrasive, coarse milling pads. 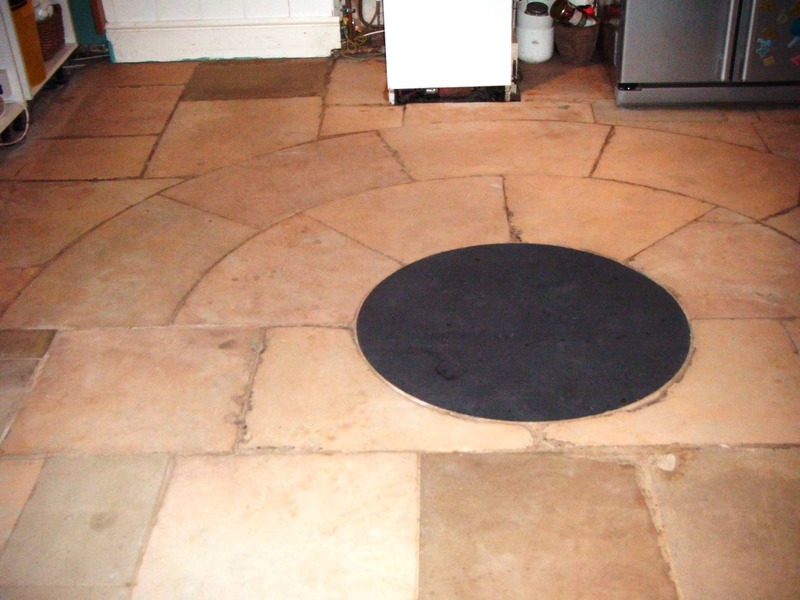 The idea is that the milling pads penetrate beneath the many layers of old sealer and re-finish the stone. In order to validate the proposed solution I conducted an experiment in a test area under the dishwasher. 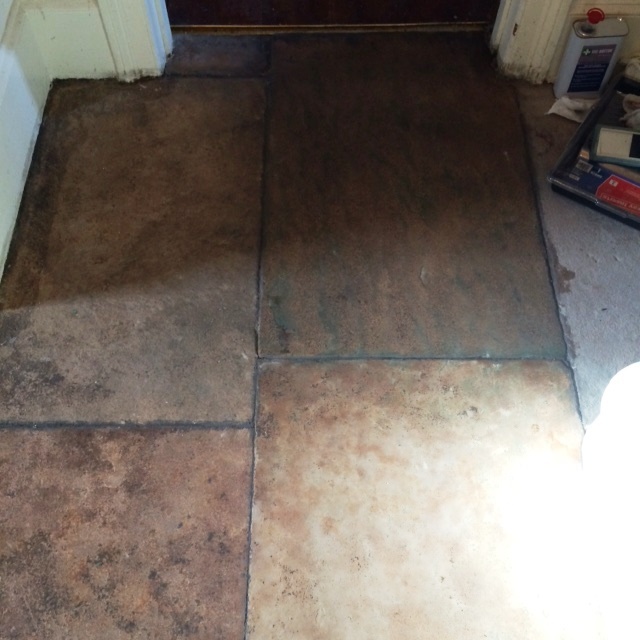 The test proved satisfactory, and so my client was happy to extend the solution to the rest of the kitchen floor. 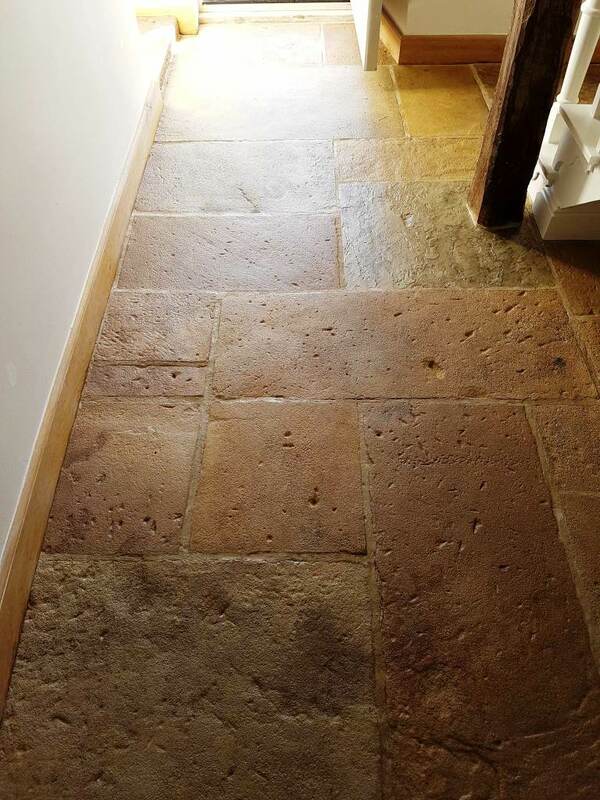 As you can see from the photos, the milling pads allowed me to get in deep where chemical products were simply unable to make a difference, giving the Sandstone tiles a much more refined look. 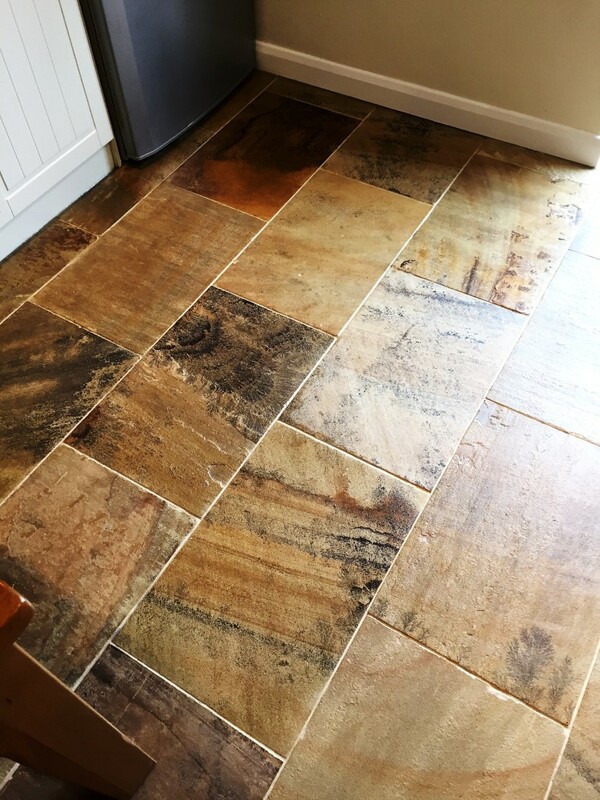 As well as flattening a stone milling does strip a tile naked so it’s necessary to seal the stone after to enhance the natural colours and features as well as protect the stone going forward. After spending all day milling the rest of the floor, it came time to give it a thorough clean to remove any remaining dirt and muck, especially along the grout lines. 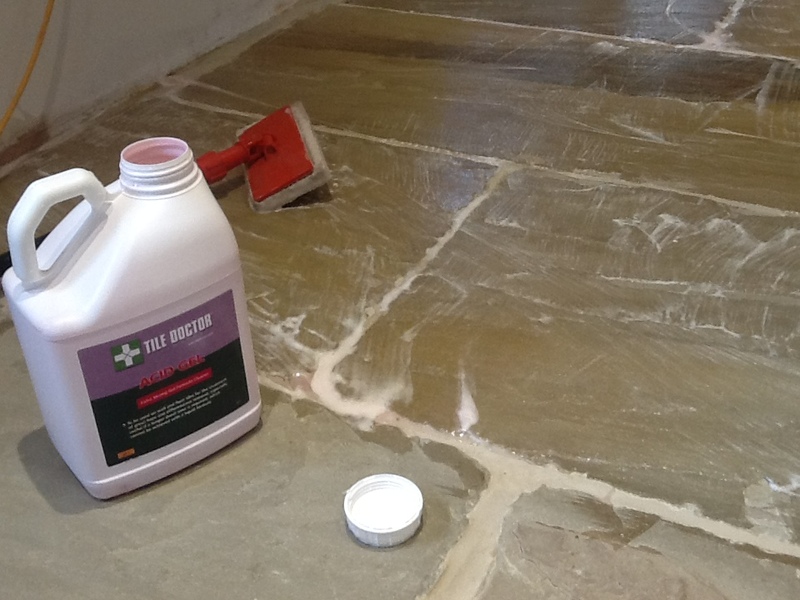 My choice of cleaner was Tile Doctor Pro-Clean, a high-alkaline cleaner which is used on most natural stone floors, including Sandstone, Granite, Limestone and Slate. 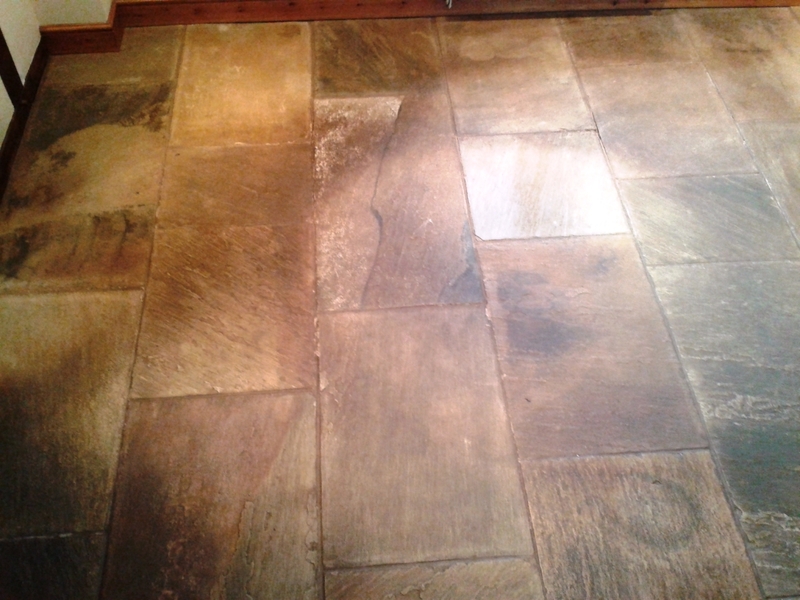 The Pro-Clean was diluted with water and then scrubbed into the tile and grout. After finishing the clean, I left for a few days as the floor needed at least 48 hours to dry completely before it could be sealed. 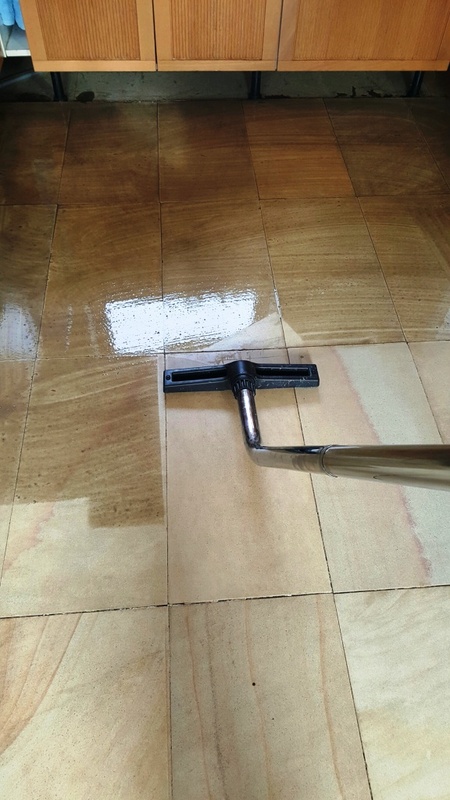 Tiled floors must always be left to dry completely before being sealed because any excess moisture or residue can damage the performance of the sealer. 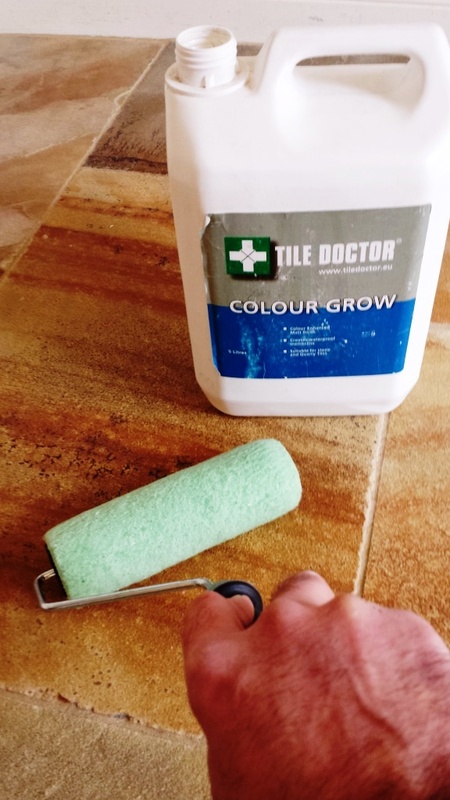 When I returned, I applied three layers of Tile Doctor Colour Grow, an impregnating, colour intensifying sealer which is designed to provide durable surface protection from within, while also accentuating the natural shades and colours in the stone. 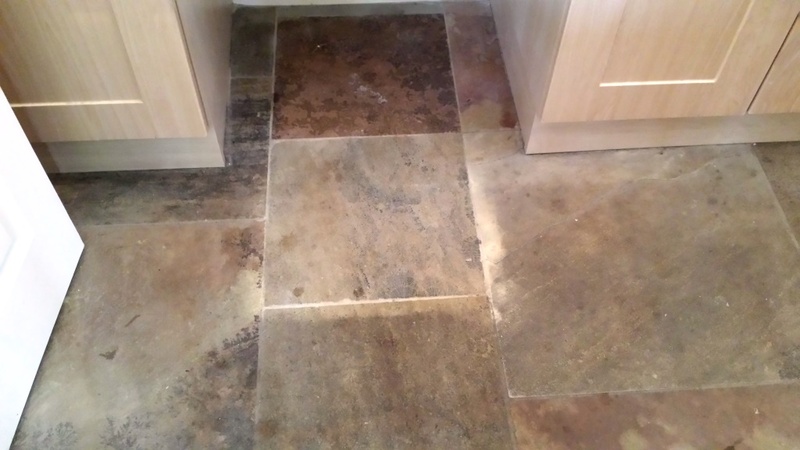 My client was very pleased with the results, and was amazed I was able to do anything to resolve the compacted sealer issue considering that the chemical products used previously were unsuccessful.